The first trees of our orchard were planted in 1978. Since then we have been planting trees every year. Every year there are new and old varieties planted, each with their own story and characteristics. Some are great and some are terrible. We value them all for their own uniqueness. The following is a list of most, but not all apples grown here on Nichols Farm and Orchard. Many of our apples are available in our online store and ready to ship anywhere in the country. Aceymac The Aceymac is a newer apple that originated in New York. It has a similarity to a McIntosh apple in appearance, but its taste is similar to a Spartan. It has a white crisp flesh and has a sweet tart taste. 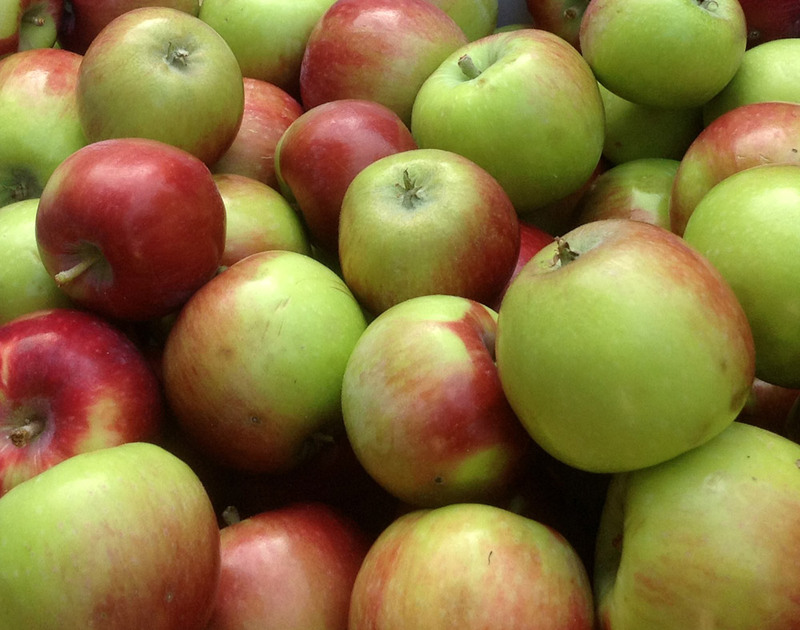 The Aceymac is excellent eaten fresh and is a great choice for apple pie. The Adina Apple originated in Australia. It has a sweet white flesh that is veryfirm. It is best when eaten fresh, but it is still an excellent cooker. Akane The Akane Apple, also known as the Tokyo Rose, was developed by the Tohoku Agricultural Experiment Station in Japan in 1970. The Akane is a cross of Jonathan and Worcester Pearmain Apples. It has a crisp, juicy, white flesh with a tart flavor that sweetens as the days get shorter. The Akane is an excellent keeper and makes an excellent dried apple. Arkansas Black The Arkansas Black originated as a seedling from a Winesap apple in Benton County, Arkansas in 1870. It has a crisp juicy yellow flesh and a distinctive taste. This apple is excellent for fresh eating, cider, and cooking. Ashmead's Kernel Ashmead’s Kernel originated in Gloucester, England in 1720. This russet apple is a high quality eating apple. It has a crisp juicy flesh. It is a tart apple with an aromatic flavor. It is also excellent when used for cooking. Beacon The Beacon Apple is a cross between the Wealthy and Malinda apples. This apple has a white crisp texture. It has a tart juicy flavor and is best for baking. Big Red Delicious The Big Red Delicious is a sport variety of the Red Delicious apple. 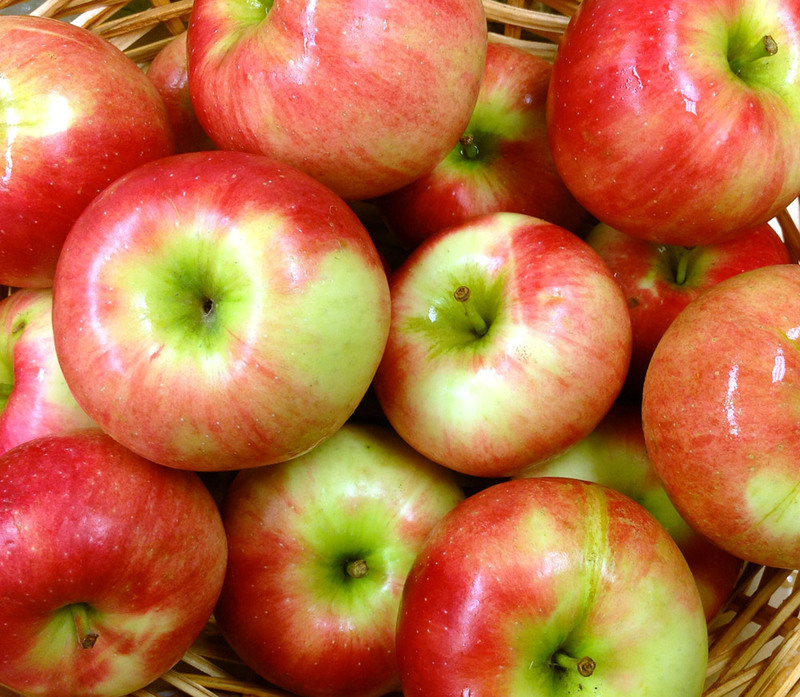 The Red Delicious apple originated as the Delicious apple in Peru, Iowa in 1880 as a yellow apple with a blush. It is a possible seedling of the Yellow Bellflower apple. It was bred to be shapelier and redder thus giving it the name change to Red Delicious. It has a crisp flesh and a sweet taste when eaten fresh. Binet Rouge Binet Rouge is an heirloom bittersweet apple from Normandy, France. It is used in many different ciders and ales. It’s most popular use is in Calvados, a French Apple Brandy. Blushing Golden The Blushing Golden apple is very similar to the Golden Delicious apple. It has excellent keeping qualities. The apple will hold its texture well for up to three months in storage. It has a crisp white flesh and is generally a sweet apple. It good eaten fresh and great baked or put in a sauce. Braeburn The Braeburn apple originated in New Zealand in 1952. It is a possible seedling of the Lady Hamil apple. The flesh is creamy and crisp. It has a sweet tart flavor and is best eaten fresh. It will last in storage for up to four months. Buckeye Gala The Buckeye Gala is a sport variety of the Gala Apple. 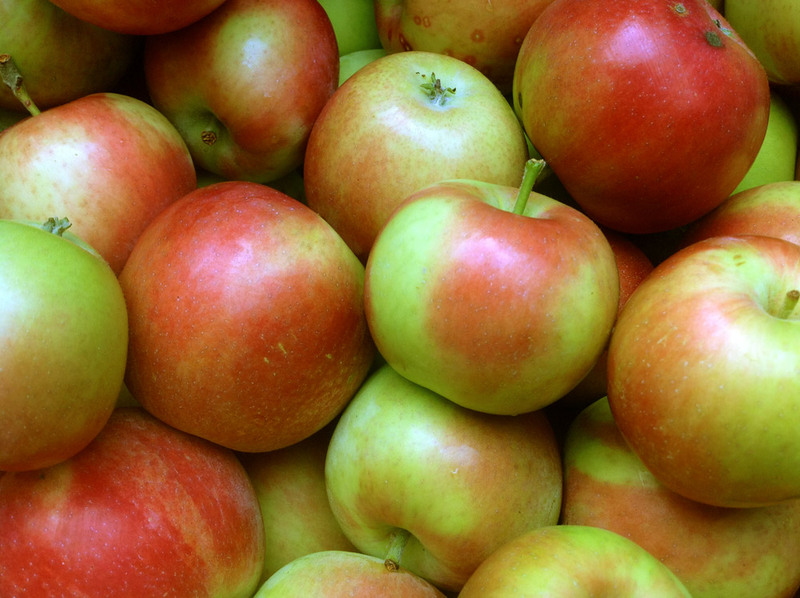 The Gala Apple is a cross between Kidd’s Orange Red and Golden Delicious Apples. The Gala was first introduced from New Zealand in 1965. It has a sweet, creamy, yellow flesh. It is great eaten fresh and is excellent for many culinary uses. Cameo The Cameo, formerly known as the Carousel apple, was discovered as a seedling by Darrel Caudle in his Red Delicious orchard in Wenatchee, Washington in the early 1980s. The Cameo is very crisp and has a mildly sweet taste. Candy Crisp The Candy Crisp is a newer New York apple. It is similar to a Golden Delicious in appearance. It has a crisp yellow flesh. Its flavor is sweet and has the aroma of a pear. This apple is great for all culinary purposes and is best eaten fresh. Chehalis The Chehalis apple originated in Oakville, Washington in 1955. It came from a possible seedling of the Golden Delicious. It is greener, bigger, and keeps longer than the Golden Delicious. It has a crisp and juicy yellow flesh. It is a sweet apple and is good for fresh eating, baking, and sauces. Chisel Jersey The Chisel Jersey is an heirloom cider apple from England. It has a bittersweet flavor that is excellent for cider. The Chisel Jersey produces biannually and is a rare find. Commander York The Commander York is a sport variety of the York Imperial apple. The York Imperial Apple originated in York, Pennsylvania in 1830. The York Imperial has a juicy yellow flesh and it has a tart flavor. It is an excellent dessert apple, especially baked. Cortland The Cortland Apple was developed in Geneva, New York in 1915. It is a cross of McIntosh and Ben Davis apples. It has snow white flesh that browns very slow, making it the best salad apple. Great for any cooking! Court Plendu Plat The Court Plendu Plat is a European apple, probably Roman, which originated in 1613. The name is derived from the term “Corps Pendu” which refers to the short stem. 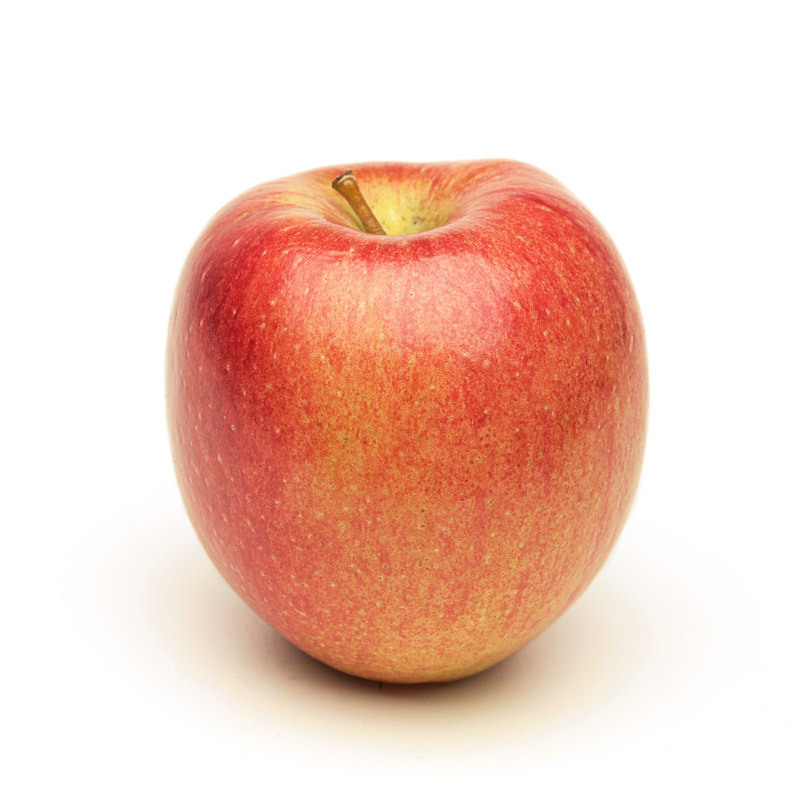 This apple has a distinctive aromatic flavor which is slightly tart. This exotic variety is best eaten fresh. Cox's Orange Pippin Cox’s Orange Pippin came from a Ribston Pippin Seedling around 1829 in England. This heirloom eating apple has a distinctive taste and aroma. The tangy flavor tastes best when eaten fresh. Criterion The Criterion apple is a cross of the McIntosh and Ben Davis apples. It was developed by the New York Agricultural Experiment Station in 1898. It has a pure white crisp flesh that is slow to brown. It has a tangy flavor and is best eaten fresh and great when used as a dessert apple. Dabinett The Dabinett apple is a seedling of the Chisel Jersey apple. 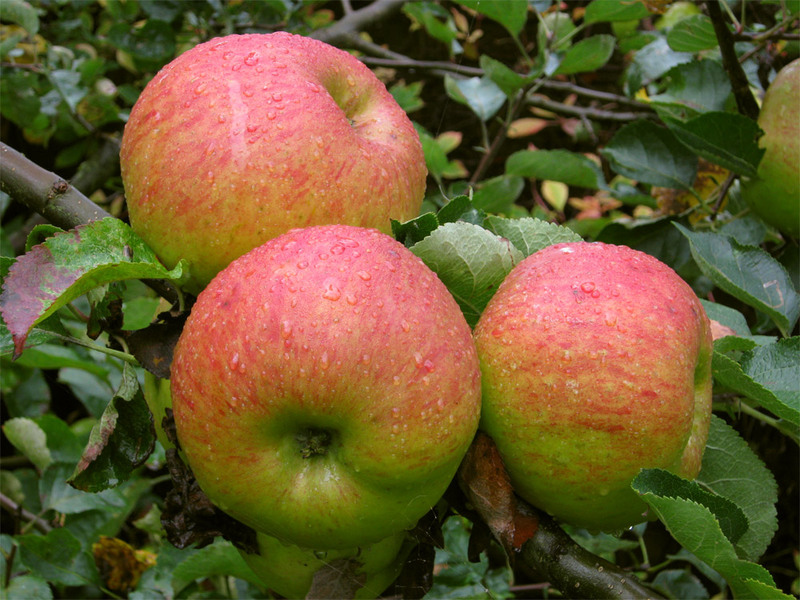 It is an English cider apple which is bittersweet. It is not recommended for fresh eating, but makes a high quality juice and is good for cooking. Dayton The Dayton Apple was developed by the Purdue Rutgers Illinois Coop in 1988. It was developed to naturally resist diseases allowing it to be grown nearly chemical free. The flesh is juicy and sweet. It is excellent eaten fresh, but best for sauces and pies. Discovery The Discovery Apple originated in Essex, England in 1949. It is a cross between a Worcester Pearmain and Beauty of Bath apples. This apple has a white flesh tinged with pink. Its flavor has a slight strawberry aroma. It is best eaten fresh and makes an excellent sauce. Duchess Also known as the Duchess of Oldenburg, this apple originated in Russia in the early 1700s. It was introduced in England in 1815. This apple is firm and juicy. It has a tart flavor and is a first class cooking apple. Duchess of Oldenburg The Early Cortland is a sport variety of the Cortland apple which ripens earlier in the summer. The Cortland Apple was developed in Geneva, New York in 1915. It is a cross of McIntosh and Ben Davis apples. It has snow white flesh that browns very slow, making it the best salad apple. Great for any cooking! Ellis Bitter The Ellis Bitter is an English Cider apple. It originated in Devon, UK. It is a bittersweet, but not as bitter as other varieties. It makes an excellent juice and adds flavor to desserts when mixed with other apples. Empire The Empire Apple is a cross of McIntosh and Red Delicious Apples that was introduced in Geneva, New York in 1966. It has a crisp white flesh that is slightly tart and becomes sweeter as the days get colder. It taste great fresh or in a dessert. Empress The Empress Apple originated in the New York State Experimental Station in 1966. 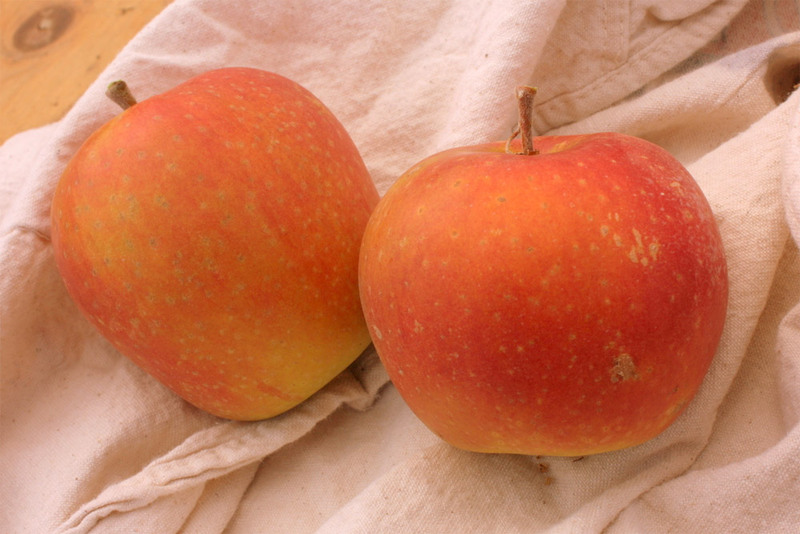 The cross between Jonamac and Vista Bella apples was first introduced in 1988. It has a aromatic, yellowish flesh that makes it great as a fresh eaten apple. Enterprise The Enterprise Apple was developed by the Purdue Rutgers Illinois Co Op in 1993. It is similar to the Idared Apple and has great cooking qualities. It has a crisp yellow flesh and its flavor becomes more intense in storage. Esopus Spitzenberg This was Thomas Jefferson’s favorite apple. It originated in Esopsus, New York in 1790. 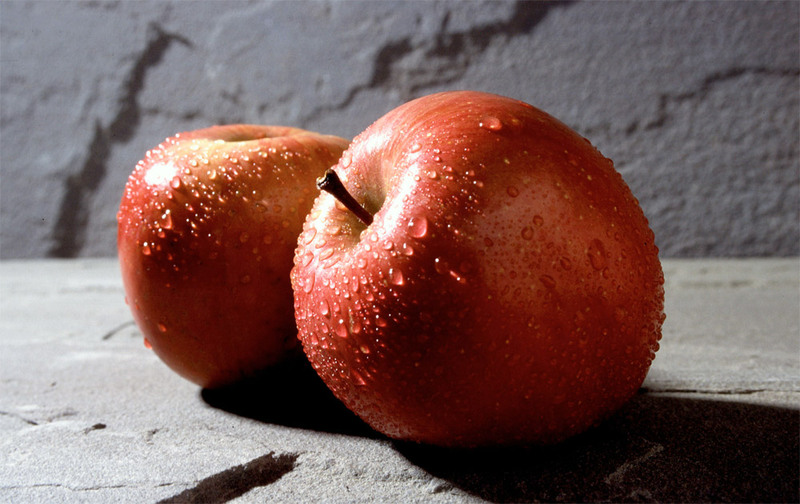 It is a dessert apple grown for connoisseurs and has a crisp, juicy flesh. Its flavor is said to be best after Christmas. Fameuse (Snow Apple) The Fameuse, also known as the Snow Apple, is the parent of the McIntosh Apple. It originated in Quebec, Canada in the 1600s. It gets its name for its pure white flesh. It has a distinctive aromatic flavor. This apple is best eaten fresh and is excellent in cider. Freedom The Freedom apple is a cross of the Macoun and Antonovka apples. It originated in New York in 1983. The Freedom is a good multipurpose apple. It is crisp, juicy, and sweet. Fuji The Fuji apple is a cross of the Ralls Janet and Delicious apples. It was developed in Japan in 1963. The Fuji apple is hard, crisp, and juicy. It has an excellent sweet tart flavor. This apple can be used for cooking but is best eaten fresh. It will keep well in storage for long periods of time. Gala The Gala Apple is a cross between Kidd’s Orange Red and Golden Delicious Apples. The Gala was first introduced from New Zealand in 1965. It has a sweet, creamy, yellow flesh. It is great eaten fresh and is excellent for many culinary uses. Galarina The Galarina apple is a cross of the Gala and Florina Querinaa apples. It was first developed in Angers, France in the 1970s and just recently released by developers in Quebec, Canada. 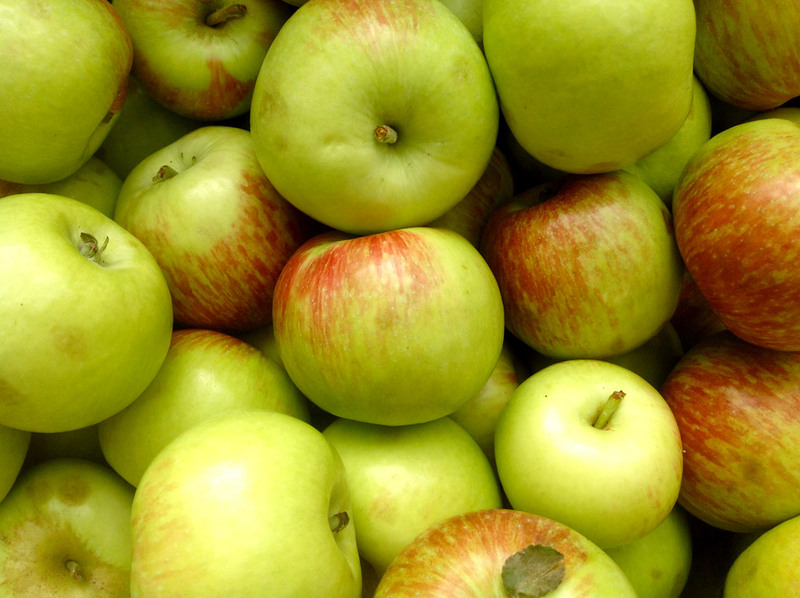 It is very similar to the Gala apple in flavor and is an excellent storing apple. It is also resistant to many diseases reducing the requirements for treatment. It has a sweet, crisp, yellow flesh and is best eaten fresh. Ginger Gold Also known as Mountain Cove, the Ginger Gold Apple is a Golden Delicious type of apple developed in Virginia around 1980. Its flesh is firm, crisp, and juicy. It is one of the best eating apples in summer and will store up to six months. 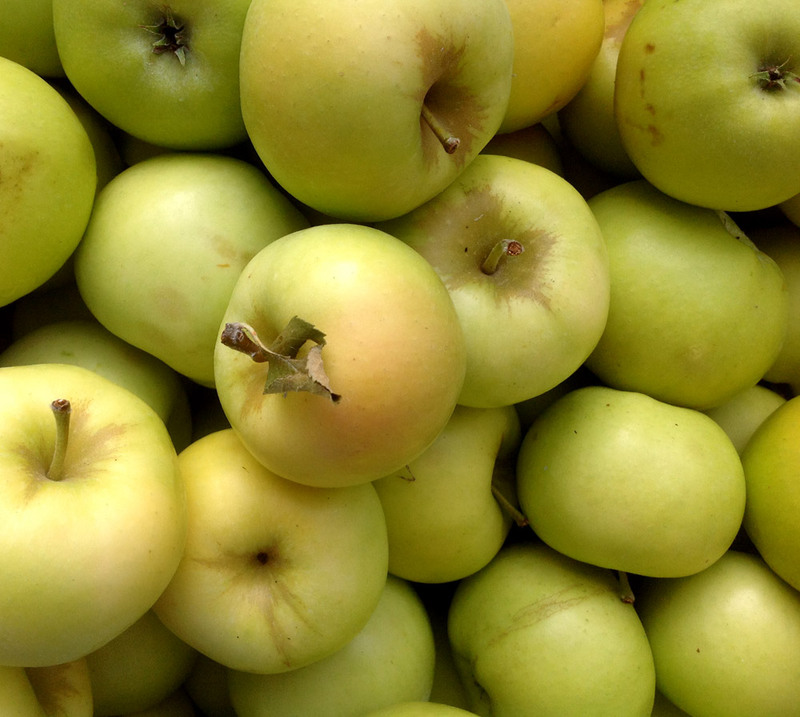 The Gold Rush apple is a cross between a Golden Delicious and an unnamed apple variety. IT was developed by the Purdue Rutgers Illinois Co Op in 1994. It is very firm and crisp. Its flavor is tart. This apple will keep in storage for longer than six months. Golden Delicious The Golden Delicious Apple came from a seedling of the Grimes Golden Apple in West Virginia. It was introduced in 1900. It has a crisp juicy flesh. This apple is sweet and has a distinct flavor. Golden Russet The Golden Russet is a seedling of the English Russet. It was developed in New York in 1845. This apple is hard, crisp, and juicy. Its flavor is sweet and it is excellent eaten fresh. 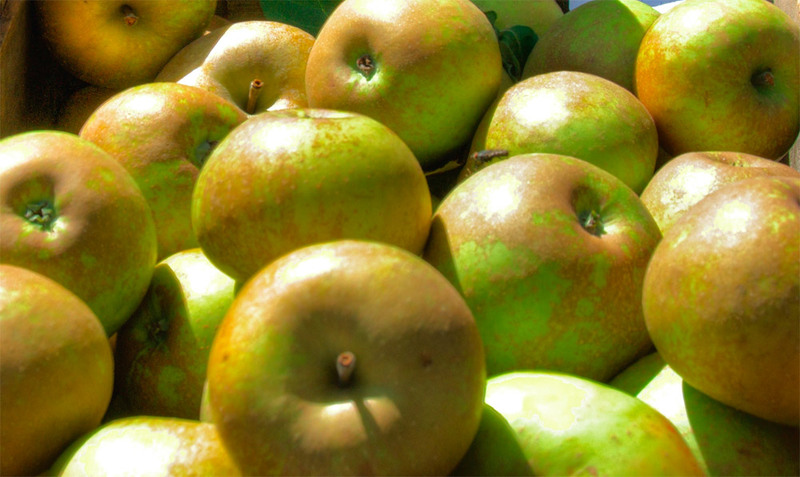 The Golden Russet is a prized cider apple. Golden Supreme The Golden Supreme was a random seedling found in Idaho in 1960. It has a resemblance to a Golden Delicious, but it is different. It has a smooth crisp flesh that is sweet. It is great eaten fresh and is excellent cooked. Grand Gala The Grand Gala is a sport variety of the Gala Apple. 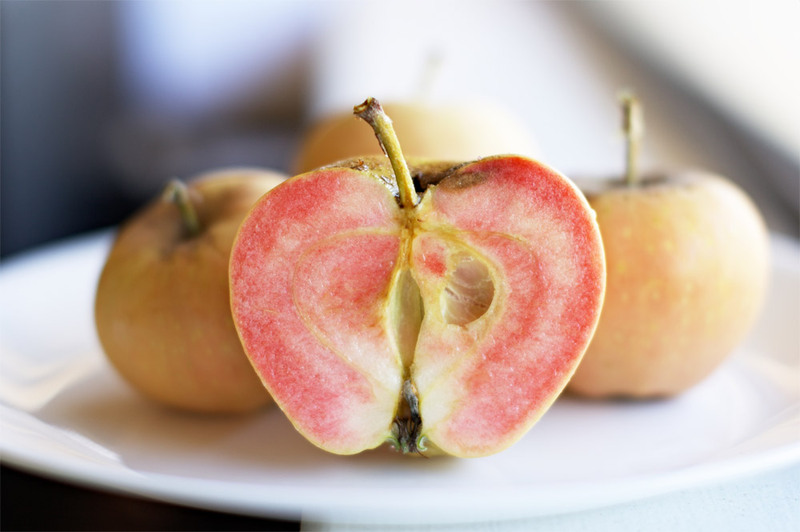 The Gala Apple is a cross between Kidd’s Orange Red and Golden Delicious Apples. The Gala was first introduced from New Zealand in 1965. It has a sweet, creamy, yellow flesh. It is great eaten fresh and is excellent for many culinary uses. 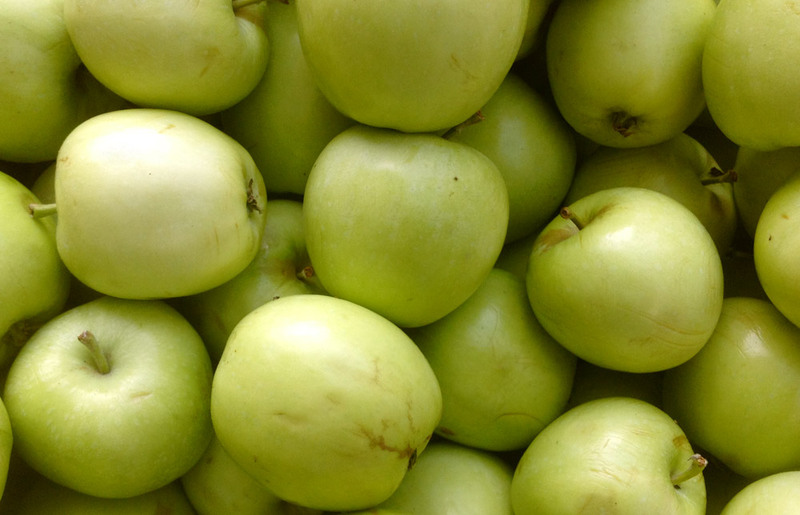 Grandspur Granny Smith The Grandspur is a sport variety of the Granny Smith apple. 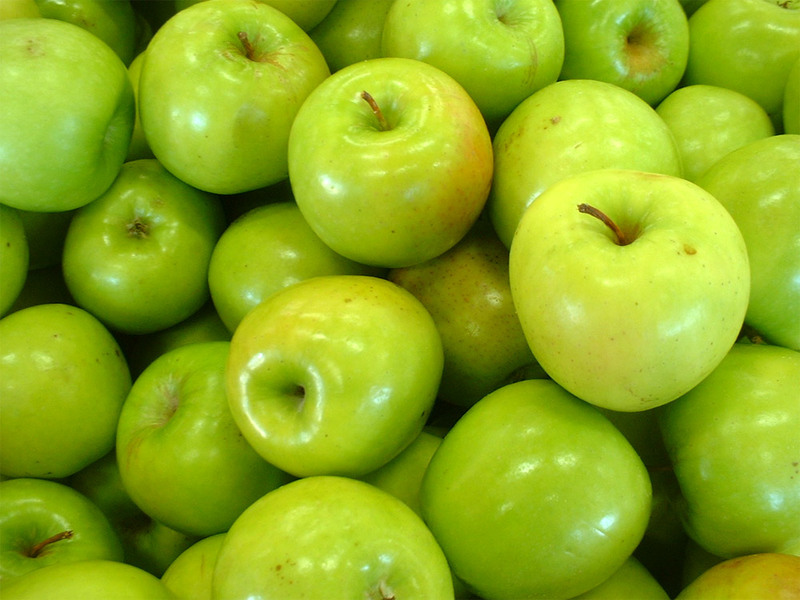 The Granny Smith apple originated in Australia in the 1850s. It has a hard crisp flesh and is very tangy. Usually completely green, this apple may blush in the cool climate of northern Illinois. This apple is great eaten fresh and is an excellent culinary apple. Grimes Gold The Grimes Golden Apple originated in West Virginia in 1832. It is the parent of the Golden Delicious Apple. It has a crisp juicy flesh with a distinct aromatic taste. It keeps well and is excellent for cider or eating fresh. 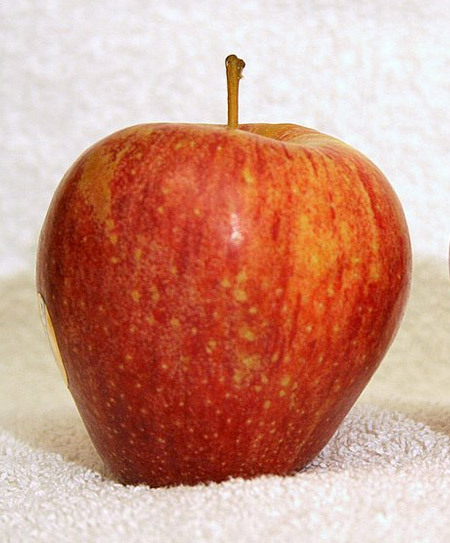 Harelred The Harelred Apple, also known as the Lautz Apple, originated in La Crescent, Minnesota. 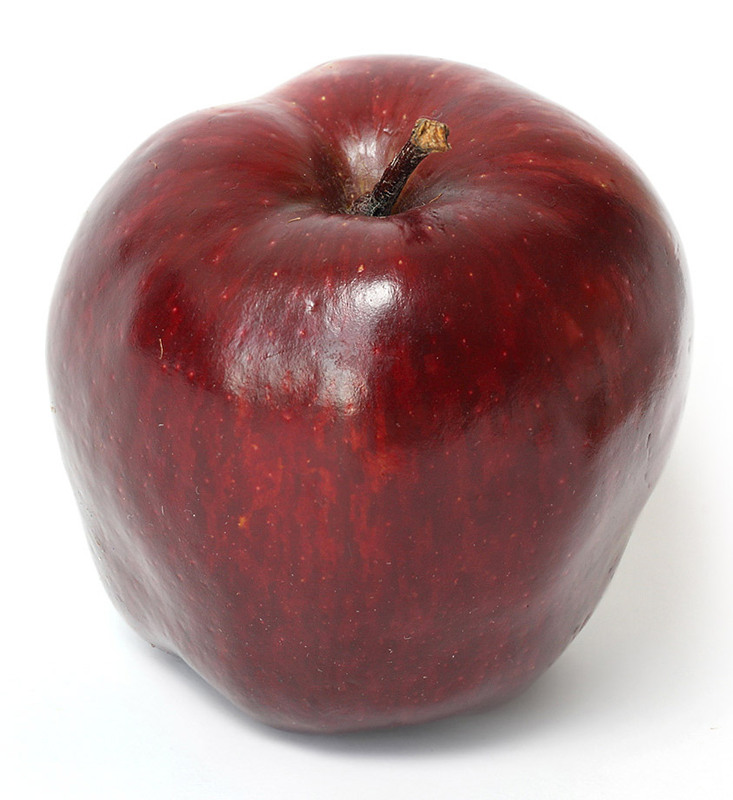 It is a type of Red Haralson Apple that is redder in color. It has a tart, juicy, crisp flesh and is an excellent keeper. Harry Masters Jersey The Harry Master’s Jersey apple is one of the top rated apples for making hard cider. 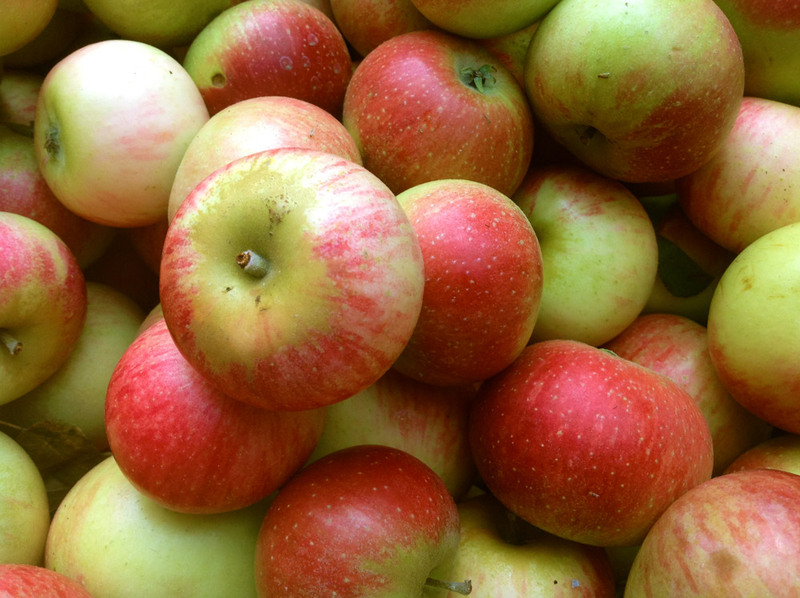 It is a bittersweet apple that adds a lot of flavor to a pie, sauces, and ciders when used sparingly. Hazen The Hazen Apple is a cross between the Duchess of Oldenburg and Starking Delicious. It was developed at North Dakota University and first introduced in 1980. 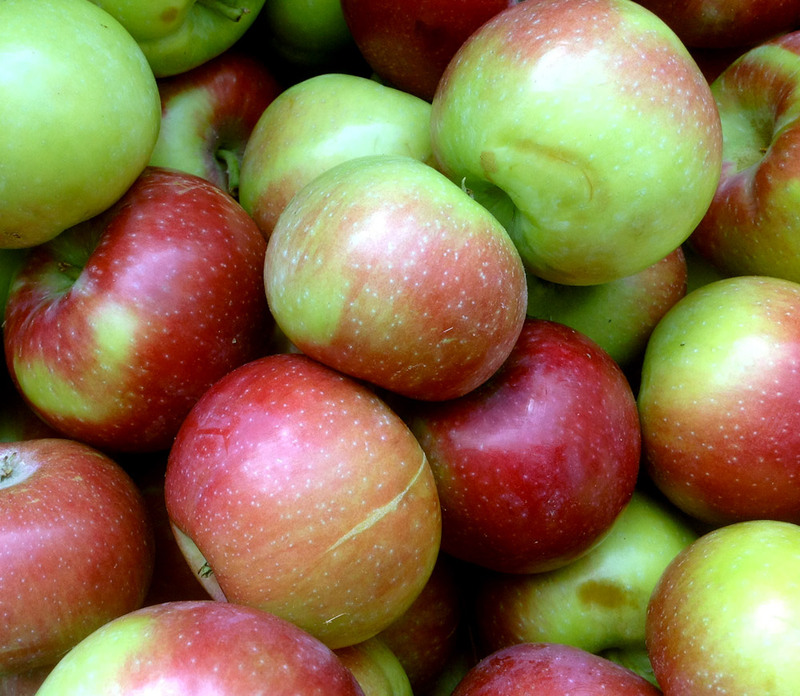 Hazen Apples have a juicy sweet flavor and are excellent for cooking. 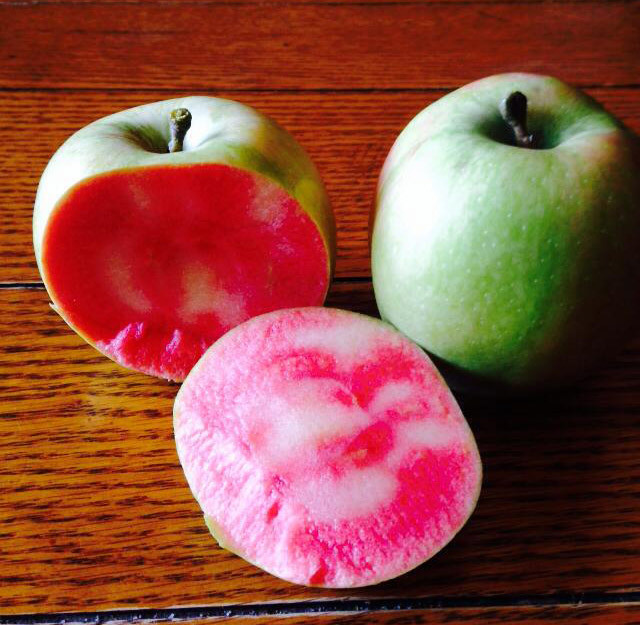 The Hidden Rose, also known as the Aerlie Red Flesh Apple, is a new variety discovered in Oregon. It has a deep red flesh which is crisp, hard, and juicy. It has a sweeter flavor and is great eaten fresh. It keeps its color when cooked and will store for most of the winter. Honeycrisp The Honey Crisp is a descendent of the Keepsake Apple and another unknown variety. It was developed in Minnesota in 1991. It is best known for its sweet crunchy flesh which makes it best for eating fresh. The Honey Crisp stores well. The Honeygold was originally grown at the University of Minnesota in 1935. 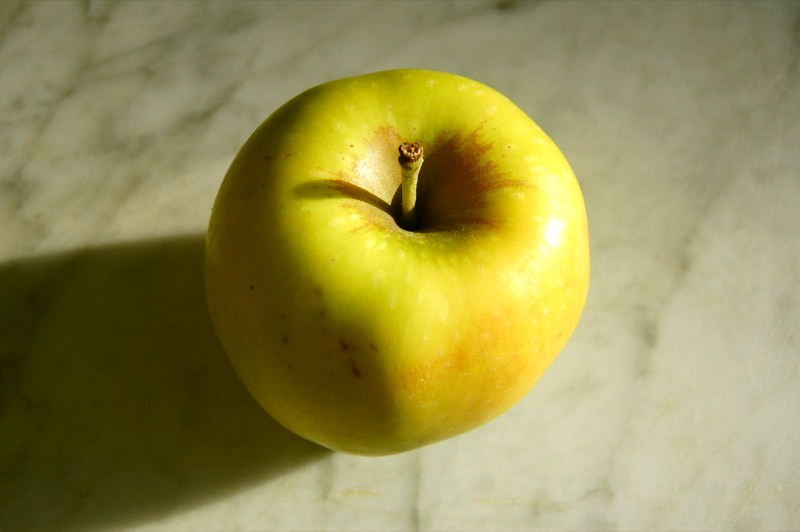 It is a cross between a Golden Delicious Apple and a Harralson Apple. 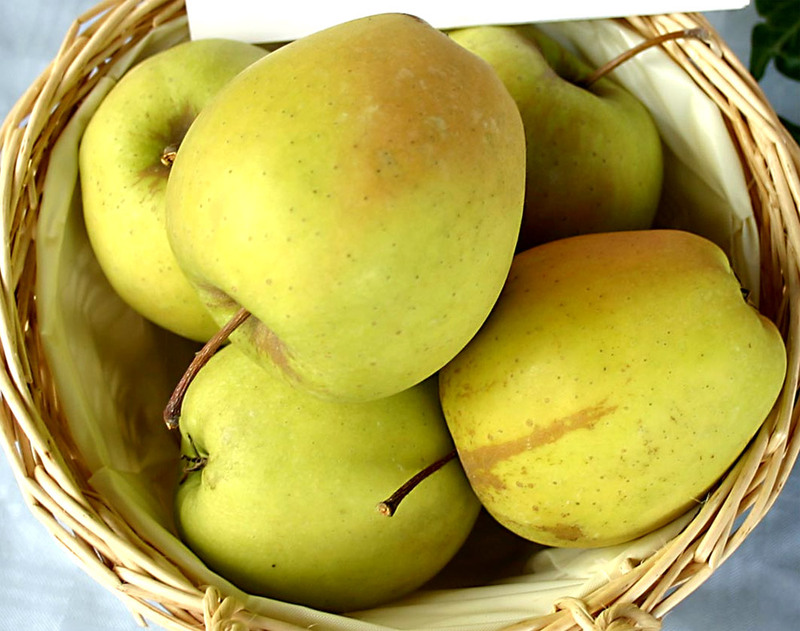 The taste is very similar to a Golden Delicious and is great eaten fresh. The Honeygold Apple stores very well. Hudson's Golden Gem Hudson’s Golden Gem originated in Oregon in 1931. It came from a seedling of an unknown apple variety. It has a crisp, sweet flesh and is best eaten fresh. Idared The Ida Red is a cross between the Jonathan and Wagener apples. It was developed in Moscow, Idaho in 1935. It keeps well and is excellent eaten fresh. The white flesh may have a pinkish tint to it which makes a nicely colored sauce. Idared Marquis The Idared Marquis is a sport variety of the Ida Red Apple. 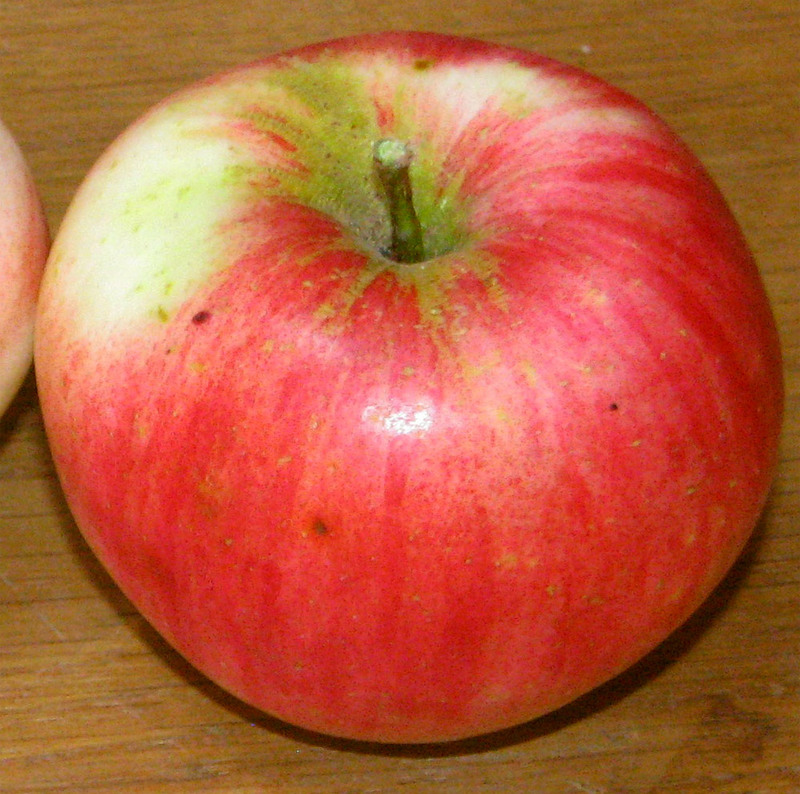 The Ida Red is a cross between the Jonathan and Wagener apples. It was developed in Moscow, Idaho in 1935. It keeps well and is excellent eaten fresh. The white flesh may have a pinkish tint to it which makes a nicely colored sauce. Imperial Gala The Imperial Gala is a sport variety of the Gala Apple. 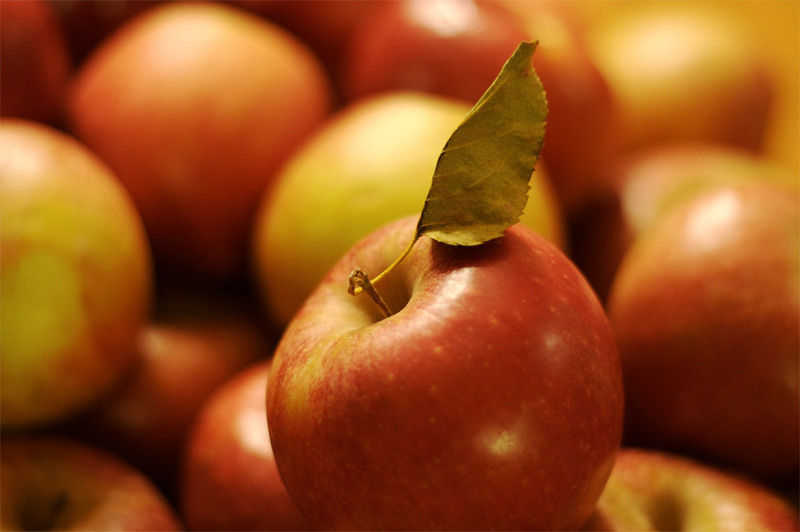 The Gala Apple is a cross between Kidd’s Orange Red and Golden Delicious Apples. The Gala was first introduced from New Zealand in 1965. It has a sweet, creamy, yellow flesh. It is great eaten fresh and is excellent for many culinary uses. Imperial Red Delicious The Imperial Red Delicious is a sport variety of the Red Delicious. 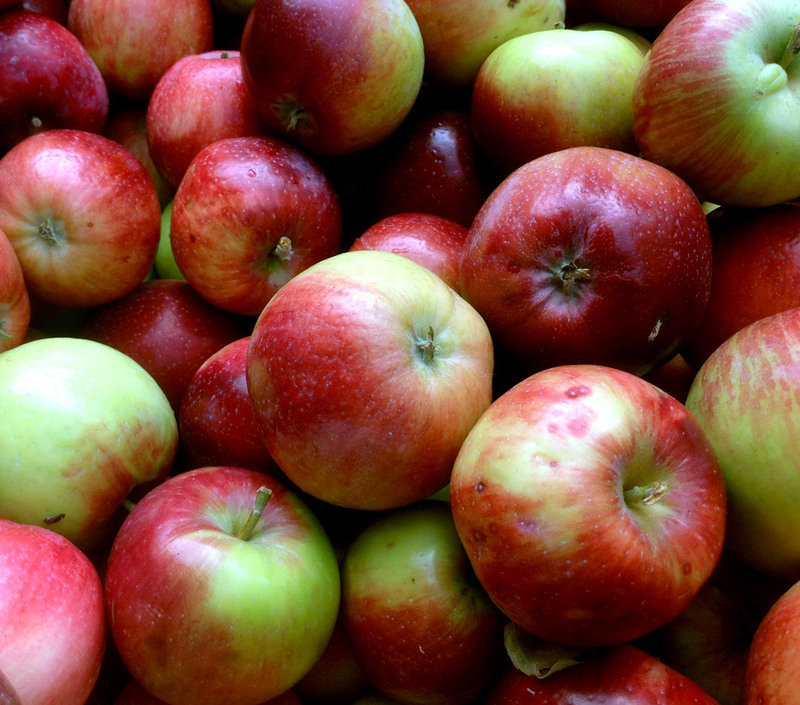 The Red Delicious apple originated as the Delicious apple in Peru, Iowa in 1880 as a yellow apple with a blush. It is a possible seedling of the Yellow Bellflower apple. 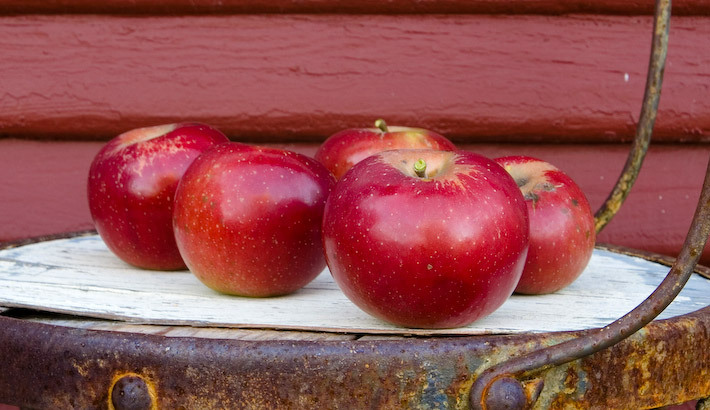 It was bred to be shapelier and redder thus giving it the name change to Red Delicious. It has a crisp flesh and a sweet taste when eaten fresh. 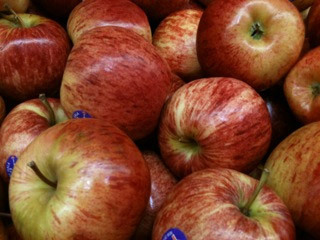 Imperial Red McIntosh The Imperial Red McIntosh is a sport variety of the McIntosh apple. The McIntosh Apple was developed in Ontario, Canada in 1798. The McIntosh Apple has a distinct perfume-like aroma. The flesh is firm, juicy, and white. It is an all purpose apple great for eating fresh, cooking, cider, or juice. Jersey Mac The Jersey Mac is an early strain of the McIntosh Apple. The McIntosh Apple was developed in Ontario, Canada in 1798. The McIntosh Apple has a distinct perfume-like aroma. The flesh is firm, juicy, and white. It is an all purpose apple great for eating fresh, cooking, cider, or juice. Jonafree The Jonafree is a hybrid developed by the Purdue Rutgers Illinois Co Op in 1979. It has a similar flavor to a Jonathan apple, but it is sweeter. The Jonafree is best eaten fresh and stores well for up to three months. Jonagold The Jonagold is a cross between the Jonathan and Gold Delicious apples. It was developed in Geneva, New York in 1968. The Jonagold has a firm, juicy, crunchy, sweet flesh. It is best eaten fresh, but is a great dessert apple as well. It will store well for up to three months. Jonaliscious The Jonalicious is a combination of Jonathan and Red Delicious Apples. This apple is very crisp with the sweetness of the Red Delicious and the spiciness of the Jonathan. Jonalicious Apples keep well and are excellent fresh or cooked. Jonamac The Jonamac is a combination of Jonathan and McIntosh Apples. It was first introduced in New York in 1972. It has a flavor similar to a McIntosh, but slightly more tart. The texture is very firm making it an ideal dessert apple. Jonared The Jonared is a sport variety of the Jonathan apple. The Jonathan Apple, also known as the Philip Rick Apple, originated in New York in 1862. The Jonathan is an excellent apple eaten fresh and stores very well. It has a crisp, juicy flesh that makes an excellent sauce. Jonathan The Jonathan Apple, also known as the Philip Rick Apple, originated in New York in 1862. The Jonathan is an excellent apple eaten fresh and stores very well. It has a crisp, juicy flesh that makes an excellent sauce. Jonnee The Jonnee is a sport variety of the Jonathan apple. The Jonathan Apple, also known as the Philip Rick Apple, originated in New York in 1862. The Jonathan is an excellent apple eaten fresh and stores very well. It has a crisp, juicy flesh that makes an excellent sauce. Kandil Sinap This elongated Turkish heirloom is a unique find. It originated in either Russia or Turkey in the early 1800s. It has a fine, crisp and juicy flesh. It is best eaten fresh and is great as a dessert. Keepsake The Keepsake is the parent of the infamous Honeycrisp apple. It is a cross of the Northern Spy and Malinda apple. It was introduced in Minnesota in 1979. The Keepsake is hard and crisp and has a sweet flavor. It is best for eating fresh and stores very well. Kidd's Orange Red The Kidd’s Orange Red is the father of the Gala apple. It is a cross of the Cox Orange Pippin and Red Delicious apples. It originated in New Zealand in 1924. This tart and crisp apple is great eaten fresh and is a highly rated dessert apple. Law Rome The Law Rome is a sport variety of the Rome Beauty Apple. 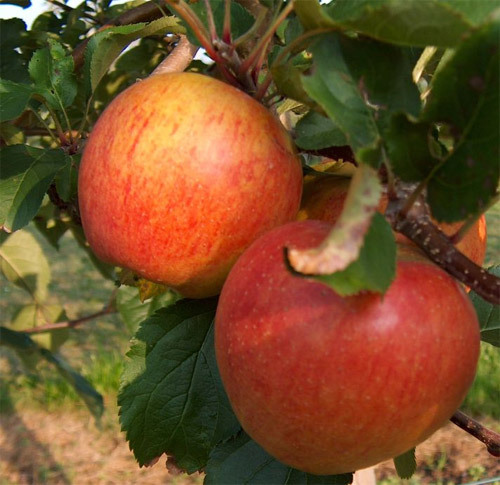 The Rome Beauty Apple originated in Ohio in 1942. This apple is the best baking apple and is great for drying. It is very firm and tart so it is best as a cooking apple. It is an excellent keeper. Liberty The Liberty Apple is a cross between a Macoun Apple and a Purdue Apple. It originated in New York in 1962. The Liberty Apple has many McIntosh-like qualities such as a fine, juicy, white flesh. It has a sweet flavor and is great eaten fresh. Lindamac The Lindamac is a sport variety of the Redmax apple. The Redmax is a sport variety of McIntosh apples which reddens more. The McIntosh Apple was developed in Ontario, Canada in 1798. The McIntosh Apple has a distinct perfume-like aroma. The flesh is firm, juicy, and white. It is an all purpose apple great for eating fresh, cooking, cider, or juice. Lodi The Lodi Apple is a cross between a Montgomery and Transparent apples. It originated in New York in 1942. It is one of the first apples of the summer. It is similar to the Transparent Apple. It has a sweet tart flavor and is excellent cooked. 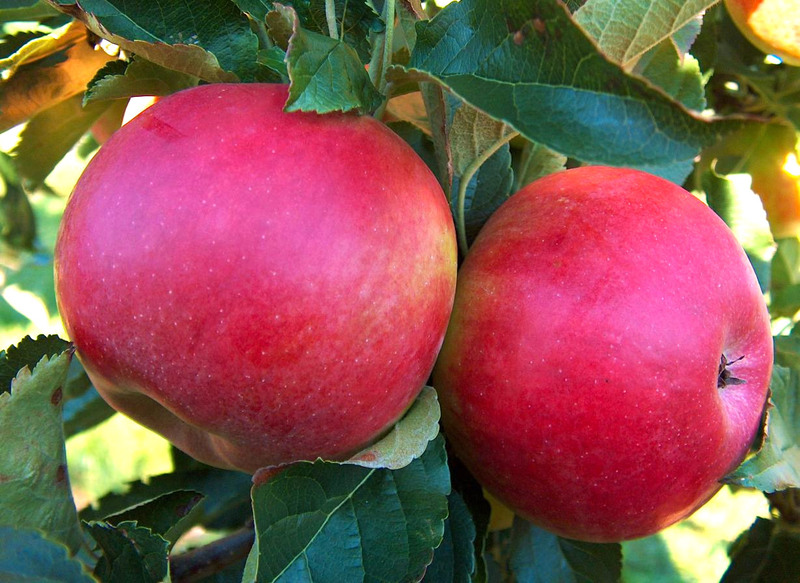 Lura Red The Lura Red is a late summer apple that has a yellowish sweet flesh. This apple is great cooked or eaten fresh. Lustre Elstar The Lustre Elstar was developed in Holland in 1955. It is a cross of Golden Delicious and Ingrid Marie. Its firm, sweet, tart flesh makes it great for fresh eating and pie. Its flavor improves after four weeks of cold storage. Macoun The Macoun apple is a cross between McIntosh and Jersey Black apples from Geneva, New York. It was developed in 1909 and introduced in 1950. The Macoun is an excellent all purpose apple, but this highly aromatic apple is best eaten fresh. Macspur The Macspur is a sport variety of the McIntosh Apple. The McIntosh Apple was developed in Ontario, Canada in 1798. The McIntosh Apple has a distinct perfume-like aroma. The flesh is firm, juicy, and white. It is an all purpose apple great for eating fresh, cooking, cider, or juice. Major The Major apple is an heirloom English cider apple. Its flesh is firm and bitter. It often used mildly to add flavor to ciders and juices. When mixed with other apples, it is excellent in a pie. Mantet This summer apple is a cross between a McIntosh and Tetofsky apples. It originated in Canada in 1929. This apple is juicy and tender. It has a sweet flavor and is excellent for eating fresh. Marshall McIntosh The Marshall McIntosh is a sport variety of the McIntosh Apple. The McIntosh Apple was developed in Ontario, Canada in 1798. The McIntosh Apple has a distinct perfume-like aroma. The flesh is firm, juicy, and white. It is an all purpose apple great for eating fresh, cooking, cider, or juice. McIntosh The McIntosh Apple was developed in Ontario, Canada in 1798. The McIntosh Apple has a distinct perfume-like aroma. The flesh is firm, juicy, and white. It is an all purpose apple great for eating fresh, cooking, cider, or juice. Medaille d'Or Medaille d’ Or is an heirloom bittersweet apple from Normandy, France. It is used in many different ciders and ales. It’s most popular use is in Calvados, a French Apple Brandy. Melrose This Jonathan and Red Delicious mix originated in Wooster, Ohio in 1944. 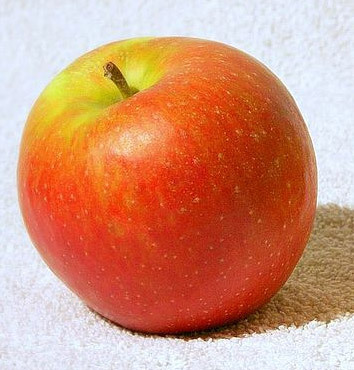 The Melrose Apple is the official Ohio State Apple. It is a firm apple and has a juicy flesh. It is an excellent dessert apple and is great for cooking. 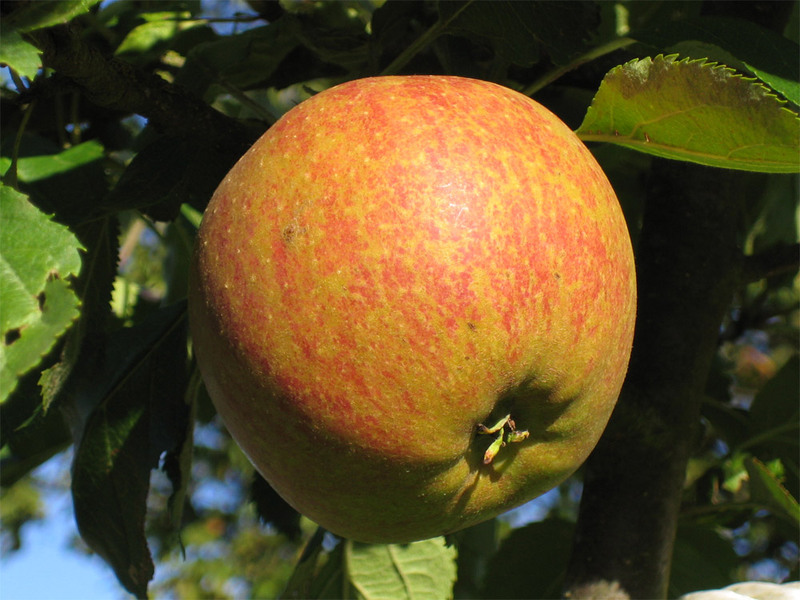 If the Melrose Apple is stored until after Christmas, it develops a pleasant fruity aroma. Melrouge The Melrouge Apple is a variety of the Melrose Apple. It is a cross between a Red Delicious and Jonathan Apple. The Melrouge Apple has an intense semi-sweet tart flavor which makes it an excellent dessert apple. Michelin The Michelin is a highly rated heirloom cider apple. It came from a seedling in Yvetot, France. 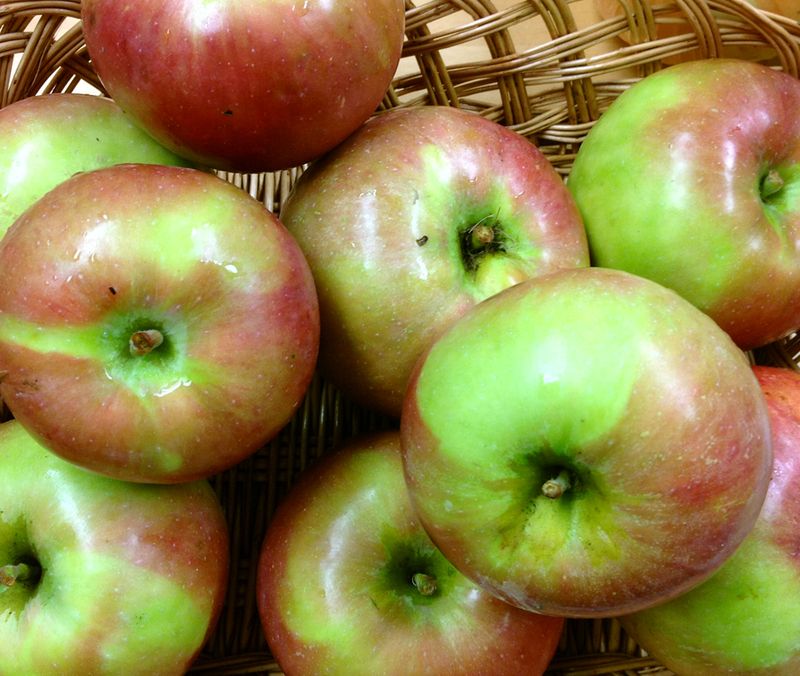 This apple is milder than other cider apples and is great mixed with other apples in desserts. 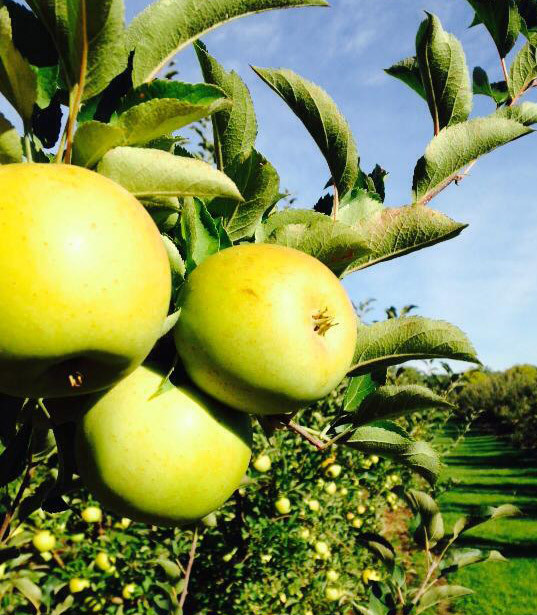 Mollie's Delicious Mollie’s Delicious is a cross of the Golden Delicious and Gravenstein Apples. It was developed in New York in 1966. The flesh is sweet and crisp which makes it best for fresh eating, but it is also great in pies. Under refrigeration, it will last up to five months. 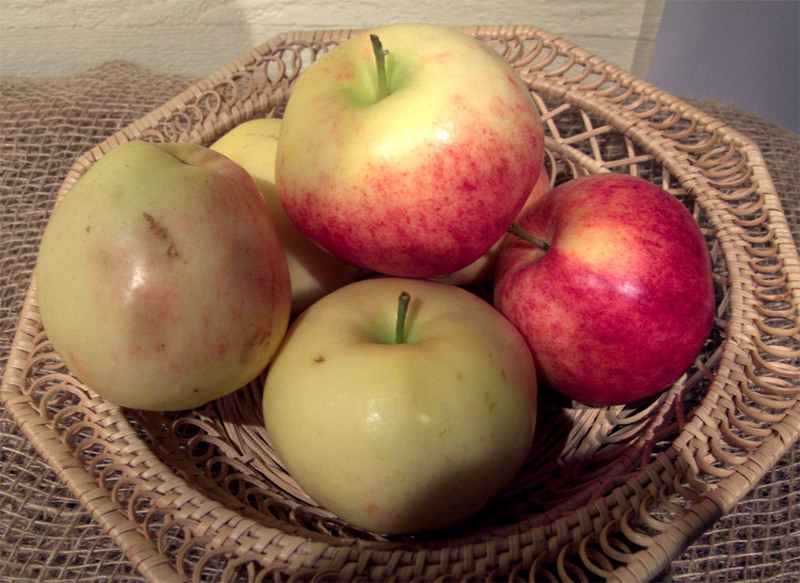 Mutsu The Mutsu apple is a cross of the Golden Delicious and Indo apples. It originated in Japan in 1930. It is sometimes called the Crispin apple, but is more commonly known as the Mutsu. The Mutsu is highly rated for ciders and sauces. It is a tart crisp apple and is great eaten fresh. Nittany The Nittany apple is a cross between a Golden Delicious and York Apples. It was developed by Pennsylvania State University. The crisp yellow flesh is juicy. The flavor is tart and is good eaten fresh. The Nittany is a good choice for a cooking apple as it holds its shape when cooked. Northern Spy The Northern Spy Apple originated in New York in 1800. It is known as one of the best cooking apples. The Northern Spy stays crisp and juicy for long periods in storage. It has a tart aromatic taste. Northwest Greening The Northwest Greening Apple is a cross between the Alexander and Golden Russet apples. It originated in Wisconsin in 1872. It has a tart firm flesh and is an ideal cooking apple. It makes a noteworthy apple sauce. Ortley This green apple is also known as the Yellow Pippin, White Detroit, Greasy Pippin, White Bellflower, Detroit, or Woolman’s Long Pippin. It originated in New Jersey in 1825. It has a firm flesh with a sweet tart flavor. It is good cooked but is best eaten fresh. Ozark Gold The Ozark Gold Apple is related to the Ben Davis Apple. It originated in Missouri in 1970. It has a similar taste to a Golden Delicious but is not of the same strain. It is very juicy and sweet like honey. Paula Red The Paula Red, also known as the Arends Apple, was developed in Michigan in 1960. The Summer Mac is closely related to this apple. It has a crisp white flesh that is mildly sweet and is excellent for baking, sauces, or cider. Pink Lady™ The Pink Lady™ apple, also known as Cripp’s Pink apple, is a premium modern apple variety. 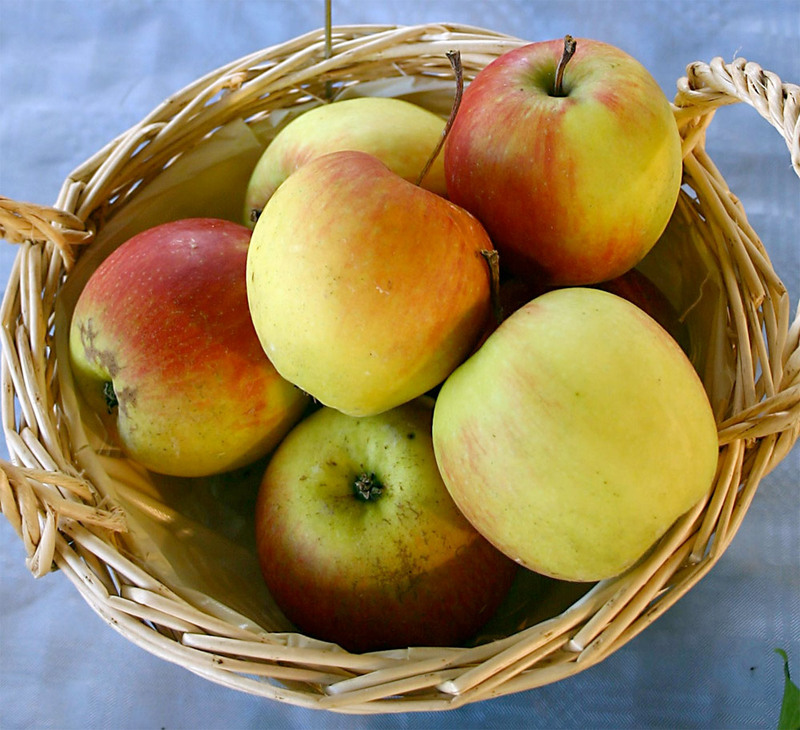 It was developed in Western Australia and is a cross between Golden Delicious and Lady Williams apples. It has a white flesh and its flavor has a great balance of sweet and tart. It is best eaten fresh and is an excellent dessert apple. Pink Pearl The Pink Pearl apple originated in California in 1944. It is a cross between a Surprise apple and another unknown variety. It has a crisp white flesh which is tinted pink and its flavor is tart. It makes a nicely colored apple sauce and is great eaten fresh. Pioneer McIntosh The Pioneer McIntosh is a sport variety of the McIntosh Apple. The McIntosh Apple was developed in Ontario, Canada in 1798. The McIntosh Apple has a distinct perfume-like aroma. The flesh is firm, juicy, and white. It is an all purpose apple great for eating fresh, cooking, cider, or juice. Porter The Porter Apple, also known as the Jennings Apple, originated in Massachusetts in 1840. The flesh is tender and sweet. 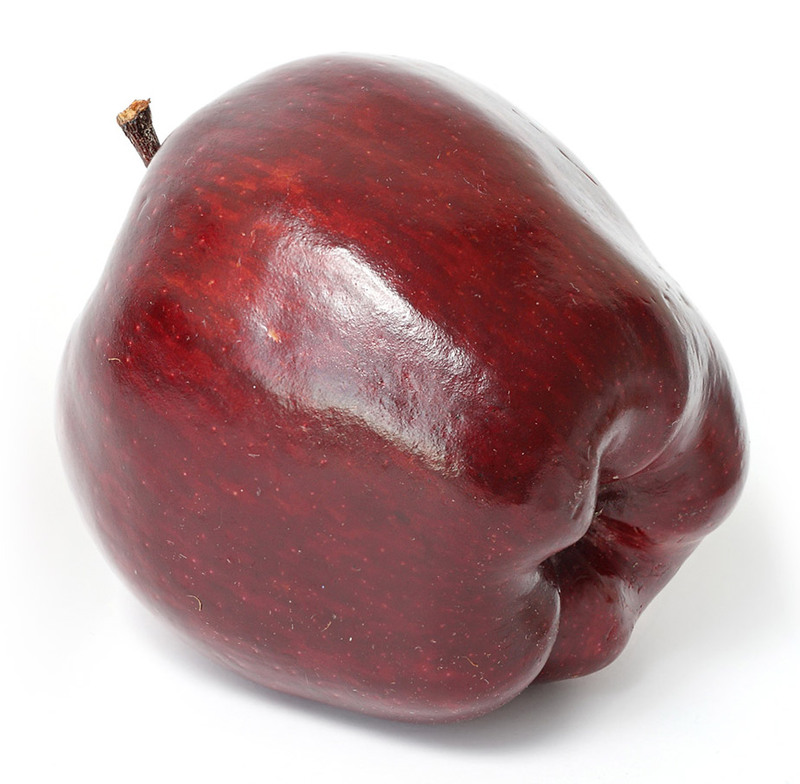 It is an exceptional cooking apple as it holds its shape during cooking. The Porter is also great eaten fresh. Prairie Spy The Prairie Spy was developed by the University of Minnesota in 1940. The flesh of this apple is very firm and juicy. The flavor is excellent and it develops in storage. 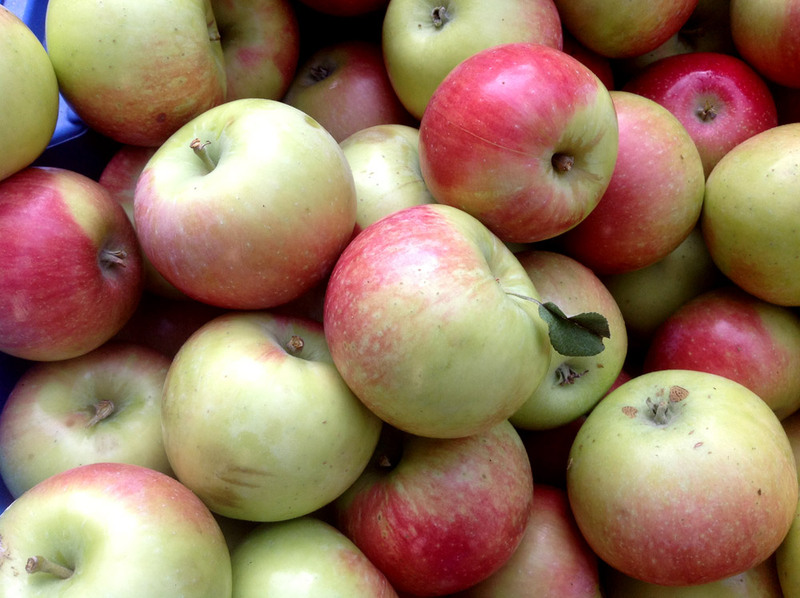 The Prairie Spy is one of the best storage apples and may last until spring. Prima The Prima Apple was developed by the Purdue, Rutgers, Illinois Co Op in 1970. It has a juicy white flesh with a mild tart taste. It is best when eaten fresh. Priscilla The Priscilla apple is a cross of the Starking Delicious and another unnamed variety. It was developed by the Purdue, Rutgers, Illinois Co Op in 1994. The flesh is crisp and white. It has a mild flavor with a hint of cinnamon. It is best eaten fresh, but is a good dessert apple as well. Pristine The Pristine apple is the most crisp and sweet summer apple. 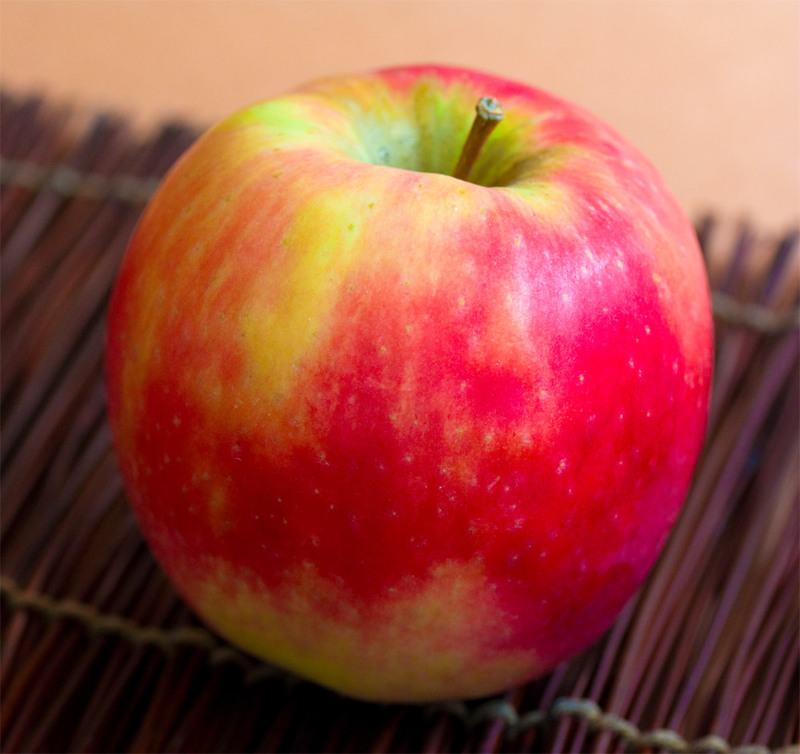 It is a newer apple variety developed by the Purdue, Rutgers, Illinois Co Op in 1994. It is a descendent of the Camuzat apple. It is best eaten fresh. Quinte This early apple is a cross between the Red Melba and Crimson Beauty apples. It was developed in Ontario, Canada in 1964. This apple is firm and crispy and is best eaten fresh. Red Chief Delicious The Red Chief Delicious is a sport variety of the Red Delicious apple. 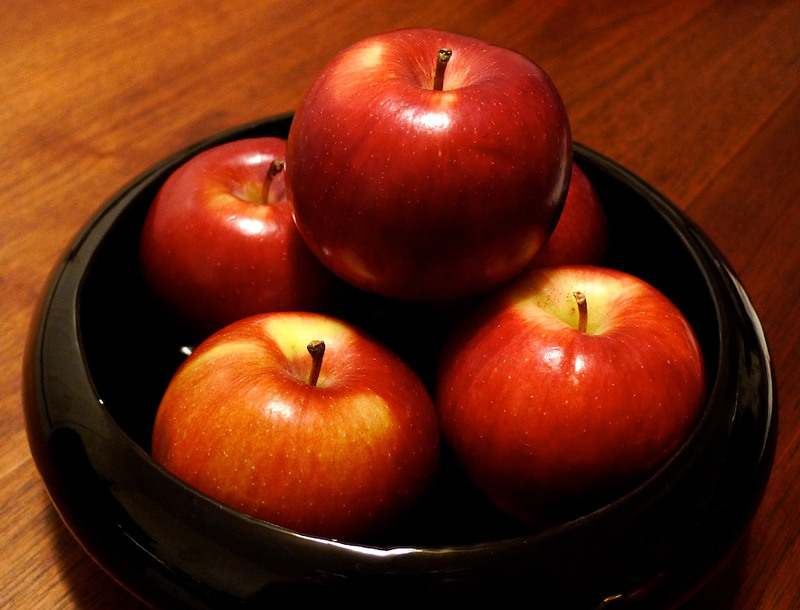 The Red Delicious apple originated as the Delicious apple in Peru, Iowa in 1880 as a yellow apple with a blush. It is a possible seedling of the Yellow Bellflower apple. It was bred to be shapelier and redder thus giving it the name change to Red Delicious. It has a crisp flesh and a sweet taste when eaten fresh. Red Cortland The Red Cortland is a sport variety of the Cortland Apple. The Cortland Apple was developed in Geneva, New York in 1915. It is a cross of McIntosh and Ben Davis apples. It has snow white flesh that browns very slow, making it the best salad apple. Great for any cooking! Red Delicious The Red Delicious apple originated as the Delicious apple in Peru, Iowa in 1880 as a yellow apple with a blush. It is a possible seedling of the Yellow Bellflower apple. 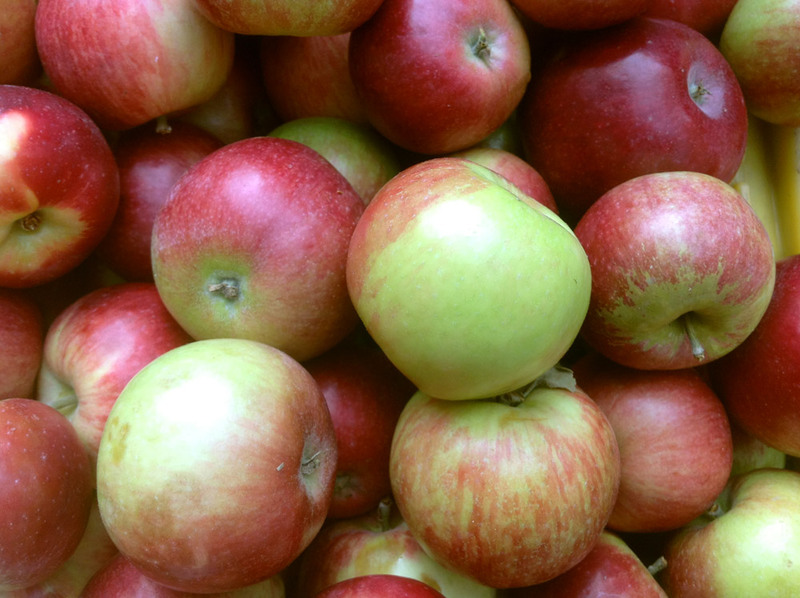 It was bred to be shapelier and redder thus giving it the name change to Red Delicious. It has a crisp flesh and a sweet taste when eaten fresh. Red Gala The Red Gala is a sport variety of the Gala Apple. 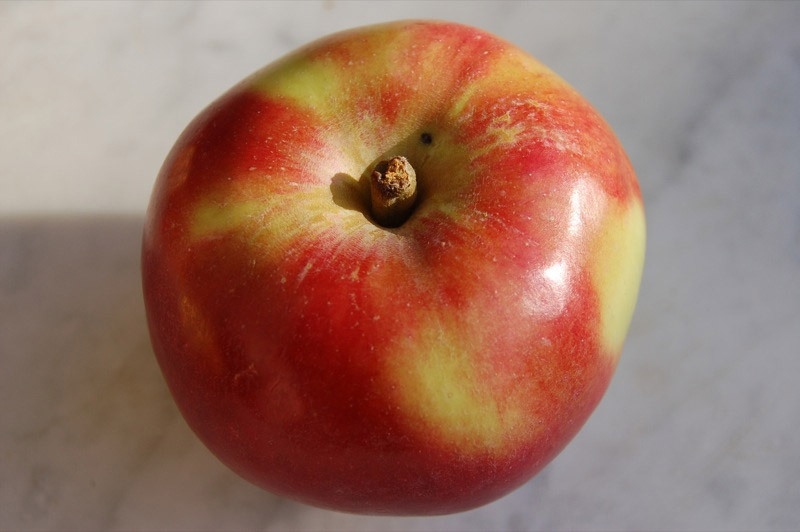 The Gala Apple is a cross between Kidd’s Orange Red and Golden Delicious Apples. The Gala was first introduced from New Zealand in 1965. It has a sweet, creamy, yellow flesh. It is great eaten fresh and is excellent for many culinary uses. Red Gravenstein The Red Gravenstein is a sport variety of the Gravenstein Apple which was developed in Italy during the 1600’s and introduced to the USA in 1790. This apple is semi tart, thin skinned, and has a crisp yellowish flesh. It is excellent for fresh eating, cooking, or cider. Red Idared The Red Ida Red is a sport variety of the Ida Red apple. 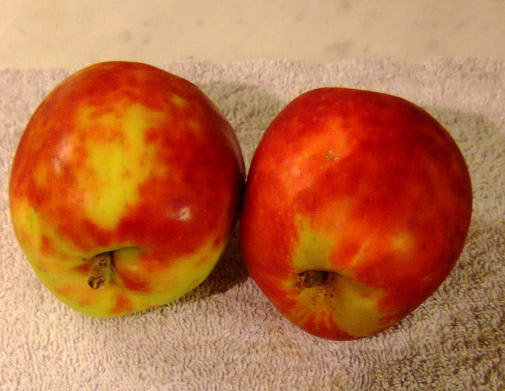 The Ida Red is a cross between the Jonathan and Wagener apples. It was developed in Moscow, Idaho in 1935. It keeps well and is excellent eaten fresh. The white flesh may have a pinkish tint to it which makes a nicely colored sauce. Red Stayman The Red Stayman is a sport variety of the Stayman apple. It originated in Kansas in 1875. It has a crisp juicy flesh. Its taste is tart and it is an excellent cooking apple. It is also great eaten fresh. Red Wealthy The Red Wealthy is a sport variety of the Wealthy Apple. The Wealthy Apple is an heirloom dessert apple that is a descendent of the Duchess Apple and an unknown variety. It was first discovered in Minnesota in 1861. It is a crisp and tart and has a good texture for baking and nice flavor for sauce. Red Yorking The Red Yorking is a sport variety of the York Imperial apple. The York Imperial Apple originated in York, Pennsylvania in 1830. The York Imperial has a juicy yellow flesh and it has a tart flavor. It is an excellent dessert apple, especially baked. Redmax The Redmax is a sport variety of McIntosh apples which reddens more. The McIntosh Apple was developed in Ontario, Canada in 1798. The McIntosh Apple has a distinct perfume-like aroma. The flesh is firm, juicy, and white. It is an all purpose apple great for eating fresh, cooking, cider, or juice. Regal Gala The Regal Gala is a sport variety of the Gala Apple. 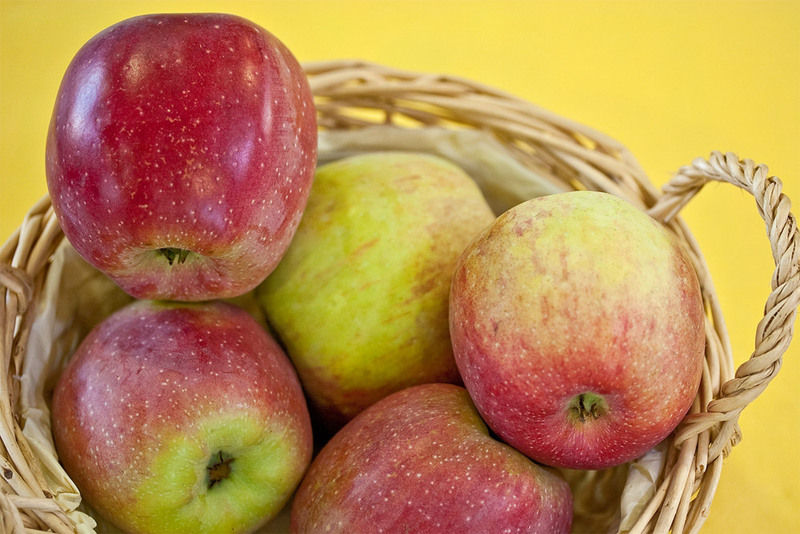 The Gala Apple is a cross between Kidd’s Orange Red and Golden Delicious Apples. The Gala was first introduced from New Zealand in 1965. It has a sweet, creamy, yellow flesh. It is great eaten fresh and is excellent for many culinary uses. 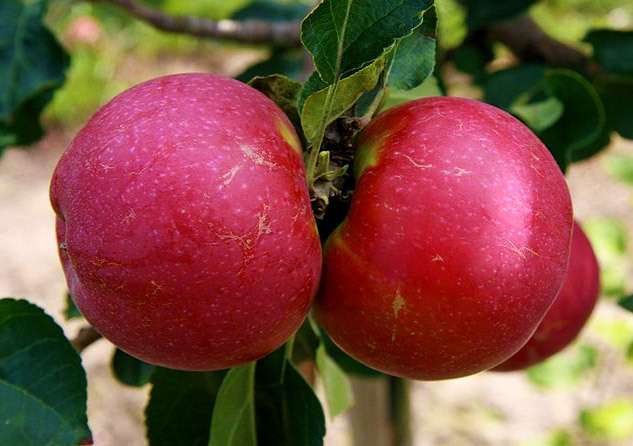 Regent The Regent apple is a cross between a Red Duchess and a Red Delicious. It was created by the University of Minnesota and introduced in 1963. This apple is crisp and sweet. It holds its shape well when cooked and is excellent eaten fresh. Rhode Island Greening The Rhode Island Greening originated in Rhode Island in 1650. This apple is firm, very crisp, and juicy. It has a tart flavor and is excellent used as a dessert apple. It is great eaten fresh as well. Rome Beauty The Rome Beauty Apple originated in Ohio in 1942. This apple is the best baking apple and is great for drying. It is very firm and tart so it is best as a cooking apple. It is an excellent keeper. Roxbury Russet The Roxbury Russet is the oldest named apple in America. It originated in Roxbury, Massachusetts in the 1600s. It has a crisp and juicy texture. Its sweet taste makes it great fresh or in cider. Royal Empire The Royal Empire is a sport variety of the Empire Apple. 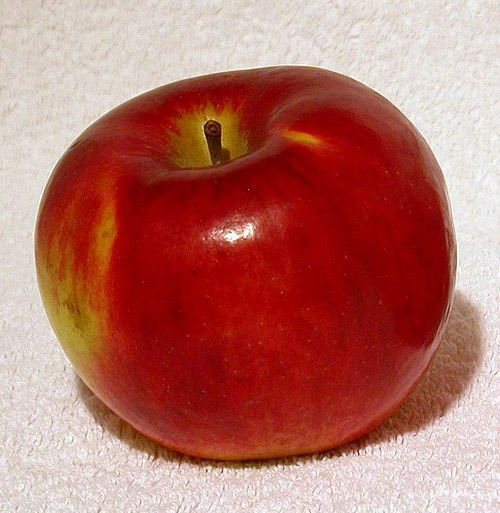 The Empire Apple is a cross of McIntosh and Red Delicious Apples that was introduced in Geneva, New York in 1966. It has a crisp white flesh that is slightly tart and becomes sweeter as the days get colder. It tastes great fresh or in a dessert. Royal Gala The Royal Gala is a sport variety of the Gala Apple. 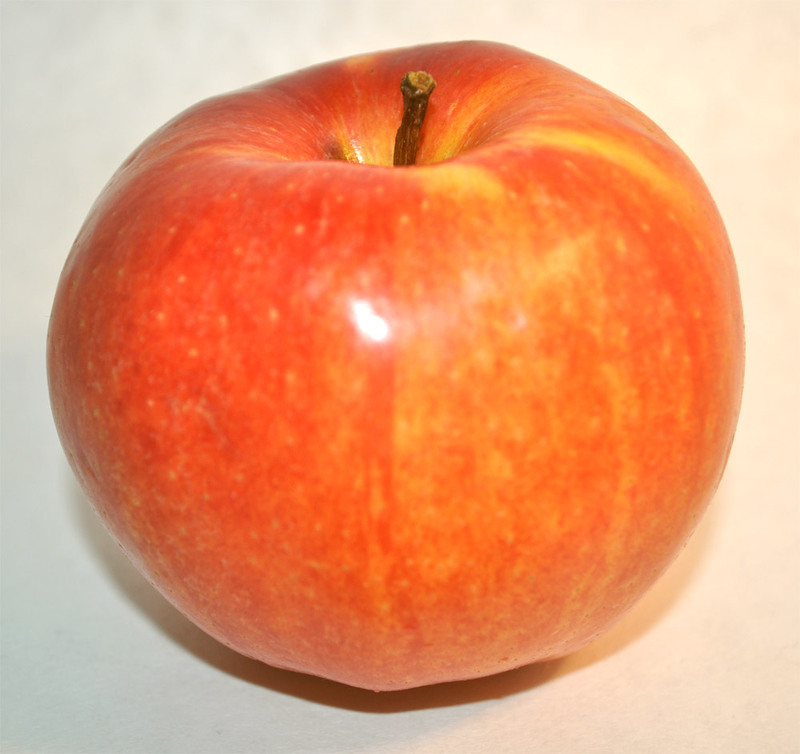 The Gala Apple is a cross between Kidd’s Orange Red and Golden Delicious Apples. The Gala was first introduced from New Zealand in 1965. It has a sweet, creamy, yellow flesh. It is great eaten fresh and is excellent for many culinary uses. Ruby Jon Also known as the Jackson Johnson apple, the Ruby Jon is a sport variety of the Jonathan Apple. The Jonathan Apple, also known as the Philip Rick Apple, originated in New York in 1862. The Jonathan is an excellent apple eaten fresh and stores very well. It has a crisp, juicy flesh that makes an excellent sauce. Sansa The Sansa Apple is a cross between the Akane and Gala apples which originated in Japan in 1969. It is crisp and sweet and is best eaten fresh. Schweitzer Orange (Swiss Orange) This Swiss heirloom, also known as the Swiss Orange, is a rare find. This apple is slightly tart, but the flavor is distinct. Compare this apple to a Cox’s Orange Pippin. 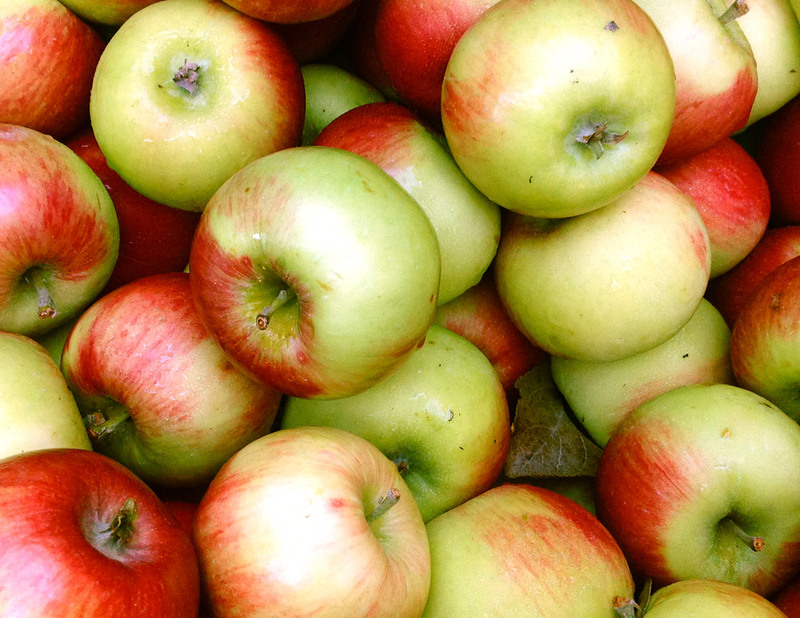 This apple is best eaten fresh, but is great in cider and many other culinary uses. Senshu The Senshu apple is a newer variety from Japan. It is a cross of the Toko and Fuji apples. The Senshu apple has a crisp yellow flesh. Its flavor is sweet and very similar to a Fuji apple. It is best eaten fresh when in season. 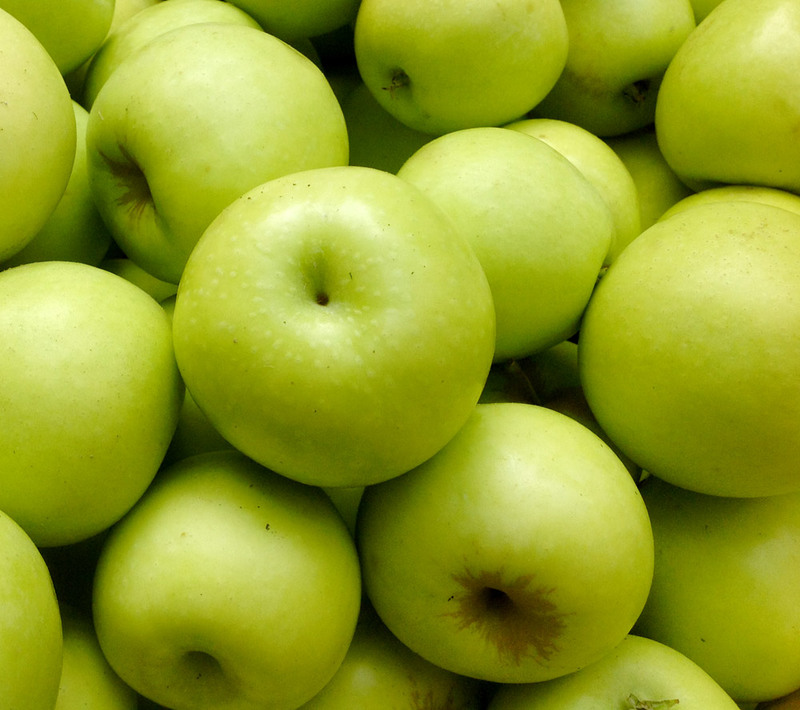 Shamrock The Shamrock is a cross between Spur McIntosh and Spur Golden Delicious apples. It originated in Summerland, British Columbia in 1992. 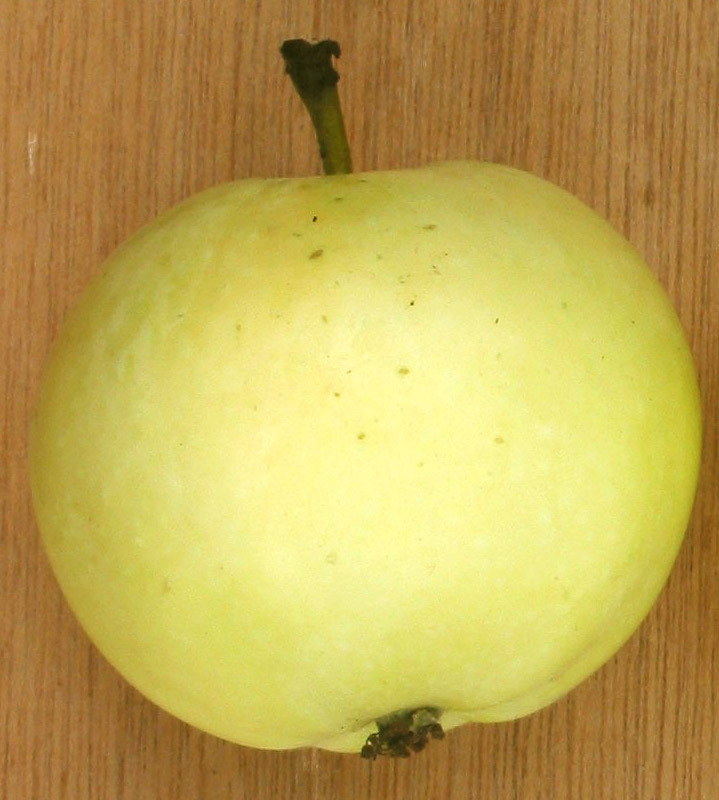 The appearance and flesh is similar to a Granny Smith. Its greenish flesh is tart, but more like the flavor of a McIntosh. This apple is great eaten fresh and is an excellent dessert apple. Shizuka The Shizuka is a cross between the Golden Delicious and Indo apples. It originated in Japan. It is similar to a Mutsu (Crispin), but a little sweeter. It has a firm texture and is excellent cooked or eaten fresh. Smokehouse The Smokehouse originated from a seedling of the Vandevere apple in Pennsylvania in 1837. It has a yellow crispy flesh. The Smokehouse has a flavor which tastes like fresh cider. It is great eaten fresh, cooked, or in juices and ciders. Smoothie Golden Delicious The Smoothie Golden Delicious is a sport variety of the Golden Delicious. 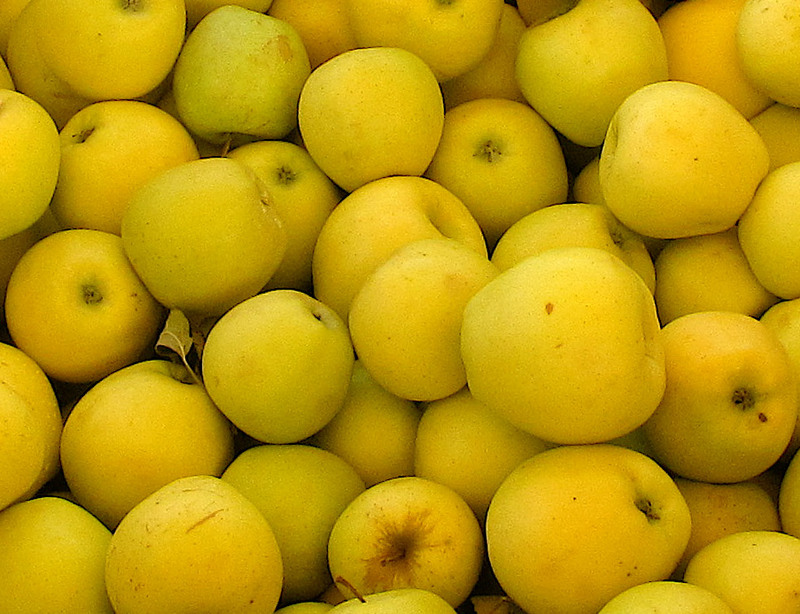 The Golden Delicious Apple came from a seedling of the Grimes Golden Apple in West Virginia. It was introduced in 1900. It has a crisp juicy flesh. This apple is sweet and has a distinct flavor. 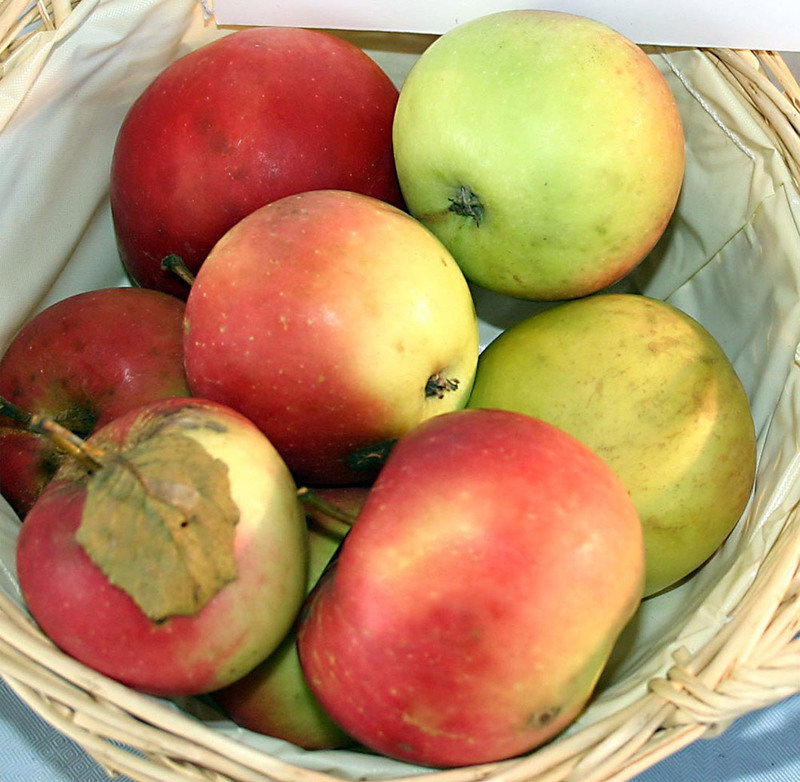 Snapp Stayman The Snapp Stayman is a sport variety of the Stayman apple. The Stayman apple, also known as the Stayman Winesap, was discovered in Kansas in 1866. 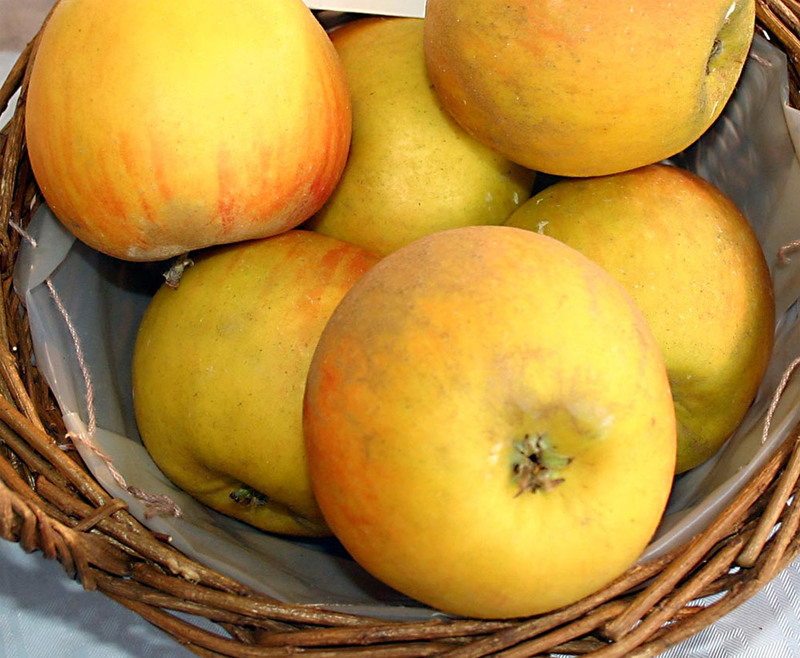 The Stayman is similar to a Winesap apple, yet it is a whole variety on its own. It has a hard crispy yellow flesh. Its flavor is tangy and is best for baking, sauces, and ciders. For a fresh eaten tart apple, its flavor is superb. Somerset Redstreak The Somerset Red Streak apple is one of the top rated apples for making hard cider. 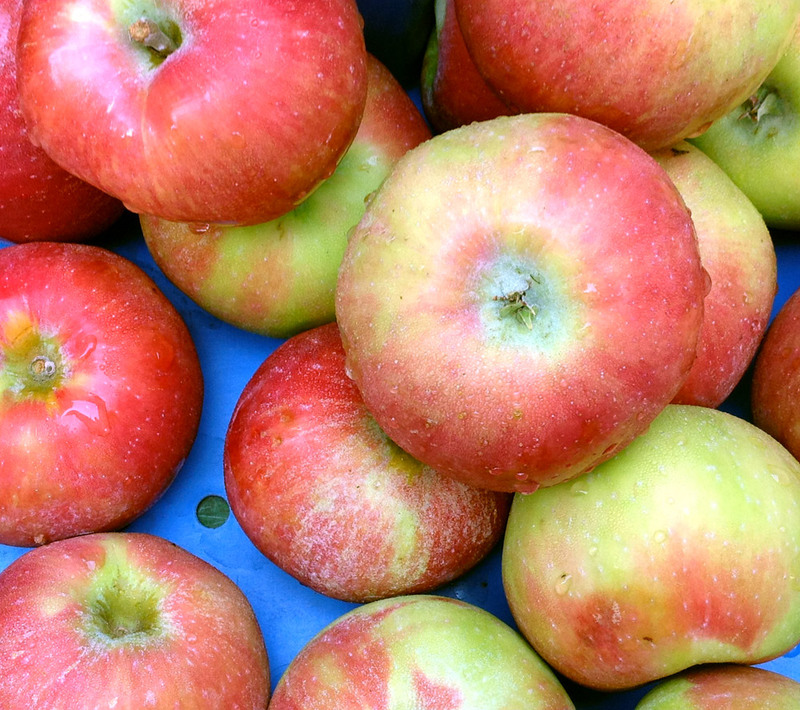 It is a bittersweet apple that adds a lot of flavor to a pie, sauces, and ciders when used sparingly. Spartan The Spartan Apple is a cross of a McIntosh and Newtown Pippin Apple. It was created and introduced in British Columbia in 1936. This apple is slightly aromatic. It has a white, crisp and sweet flesh that makes it great eaten fresh. Spigold The Spigold is a cross between the Golden Delicious and Northern Spy apples. It originated in New York in 1962. The texture is firm and the taste is a tangy sweet flavor. It is one of the best cooking apples and stores very well. Spuree Rome The Spuree Rome is a sport variety of the Rome Beauty Apple. 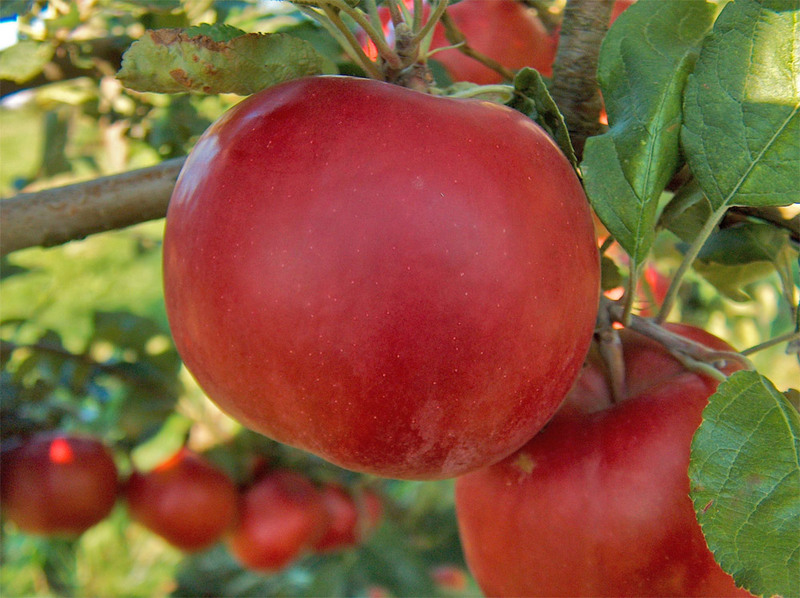 The Rome Beauty Apple originated in Ohio in 1942. This apple is the best baking apple and is great for drying. It is very firm and tart so it is best as a cooking apple. It is an excellent keeper. 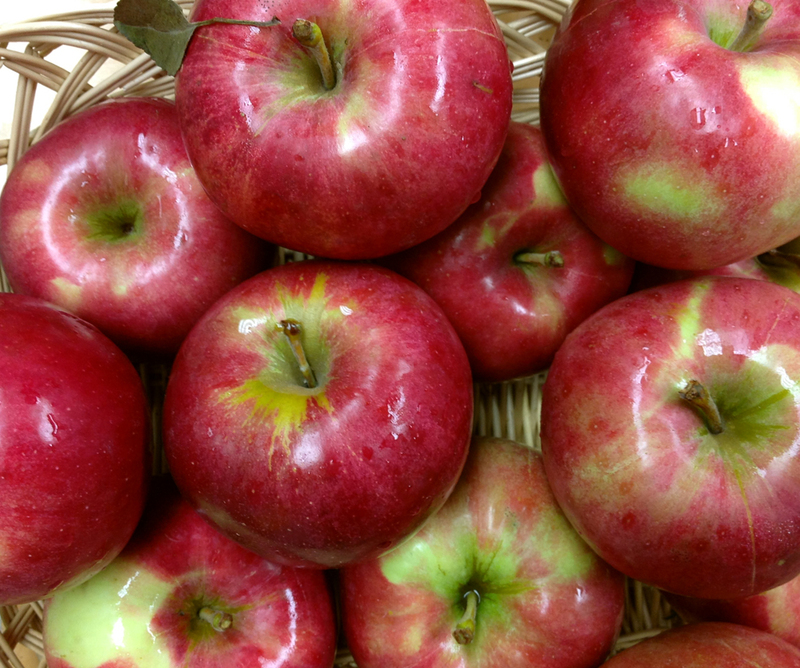 Starking Delicious The Red Starking Delicious is a sport variety of the Red Delicious apple. The Red Delicious apple originated as the Delicious apple in Peru, Iowa in 1880 as a yellow apple with a blush. It is a possible seedling of the Yellow Bellflower apple. 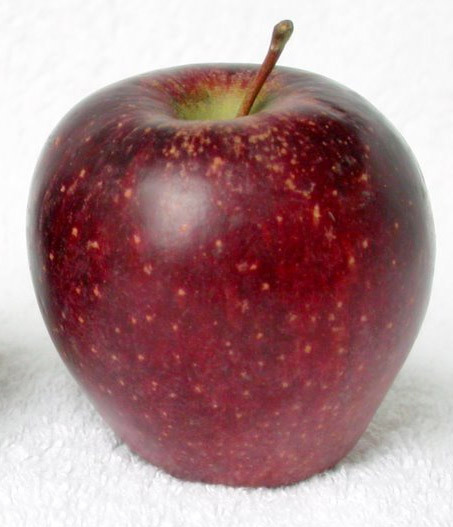 It was bred to be shapelier and redder thus giving it the name change to Red Delicious. It has a crisp flesh and a sweet taste when eaten fresh. 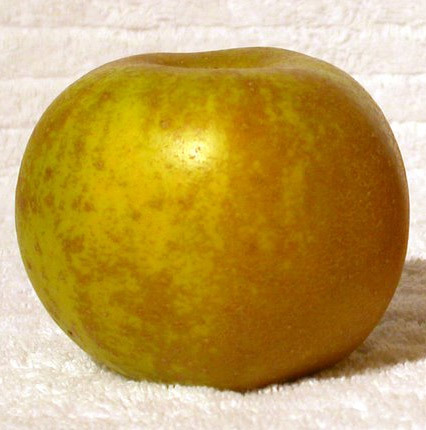 Starkspur Golden Delicious The Starkspur Golden Delicious is a sport variety of the Golden Delicious. 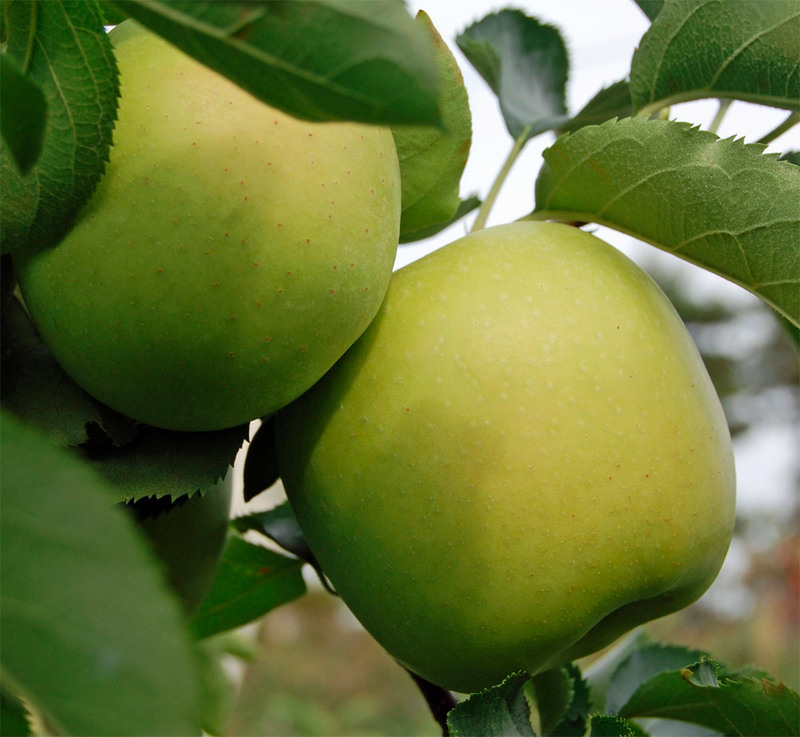 The Golden Delicious Apple came from a seedling of the Grimes Golden Apple in West Virginia. It was introduced in 1900. It has a crisp juicy flesh. This apple is sweet and has a distinct flavor. Starkspur McIntosh The Starkspur McIntosh is a sport variety of the McIntosh. The McIntosh Apple was developed in Ontario, Canada in 1798. The McIntosh Apple has a distinct perfume-like aroma. The flesh is firm, juicy, and white. It is an all purpose apple great for eating fresh, cooking, cider, or juice. State Fair State Fair is a cross between Mantet and Oriole Apples. It was introduced in Minnesota in 1979. It has a juicy, sweet, white flesh that is very crisp for an early apple. They are excellent eaten fresh and store well. Staybrite Stayman The Staybrite Stayman is a sport variety of the Stayman apple. 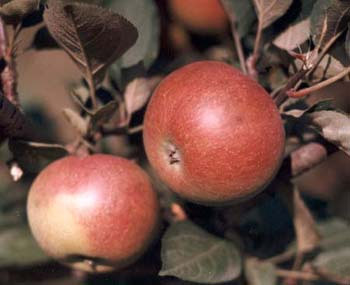 The Stayman apple, also known as the Stayman Winesap, was discovered in Kansas in 1866. 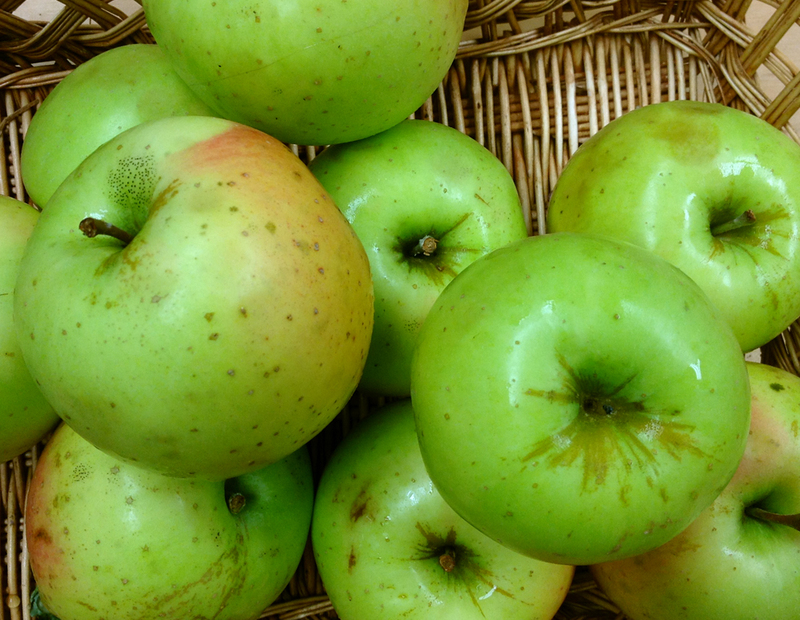 The Stayman is similar to a Winesap apple, yet it is a whole variety on its own. It has a hard crispy yellow flesh. Its flavor is tangy and is best for baking, sauces, and ciders. For a fresh eaten tart apple, its flavor is superb. Stayman he Stayman apple, also known as the Stayman Winesap, was discovered in Kansas in 1866. 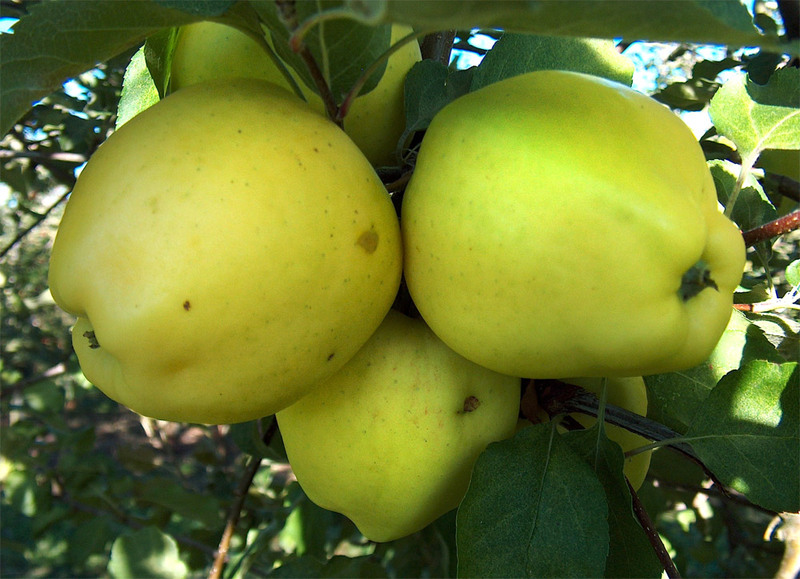 The Stayman is similar to a Winesap apple, yet it is a whole variety on its own. It has a hard crispy yellow flesh. Its flavor is tangy and is best for baking, sauces, and ciders. For a fresh eaten tart apple, its flavor is superb. Summer Mac The Summer Mac is similar to a McIntosh but of a different strain altogether. It is a popular northeast apple. It has a sweet tart flavor and a crisp white flesh. It stores well for short term. Summer Rambo The Summer Rambo Apple originated in France in 1535. It is also known as the Rambour Franc, Lorraine, or Rambour d’ete apple. The Summer Rambo was introduced to Colonial America in 1767. This apple is very crisp and has an tart aromatic flavor. It is best for cooking. Summer Red The Summer Red is similar in taste and texture to the Red Delicious. It is very juicy and firm. It is great for eating fresh and makes excellent apple sauce. Summer Treat This apple is a cross of Mollie’s Delicious and was developed in New Jersey in 1982. Its creamy flesh is crisp and sweet. It is best eaten fresh. Suncrisp The Suncrisp is a cross of Golden Delicious, Cortland, and Cox’s Orange Pippin apples. This apple has a juicy and crisp flesh. Its taste is semi tart and is good eaten fresh. It is good for baking and sauces as well. Sunrise The Sunrise Apple originated in Summerland, British Columbia, Canada. It has an unknown parentage. This apple has a unique pear-grape flavor. This apple is best eaten fresh. Supreme Staymared The Supreme Staymared is a sport variety of the Stayman apple. 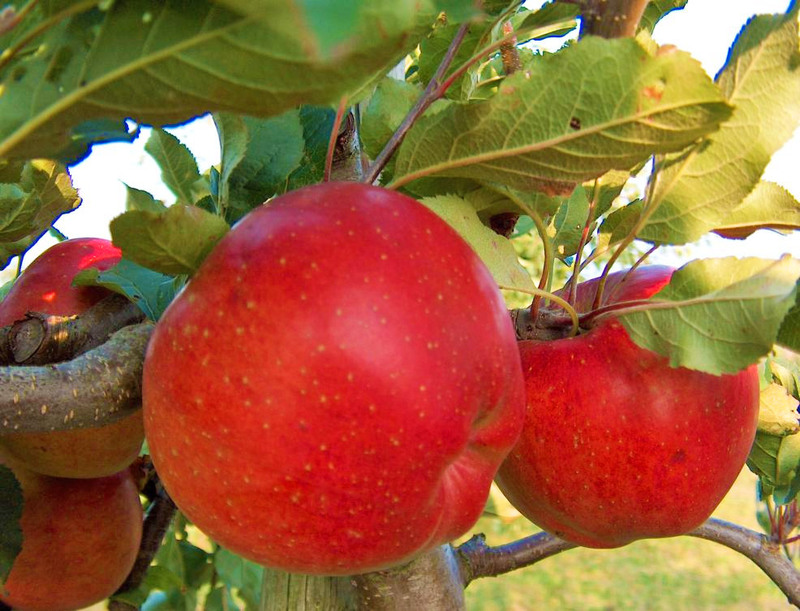 The Stayman apple, also known as the Stayman Winesap, was discovered in Kansas in 1866. 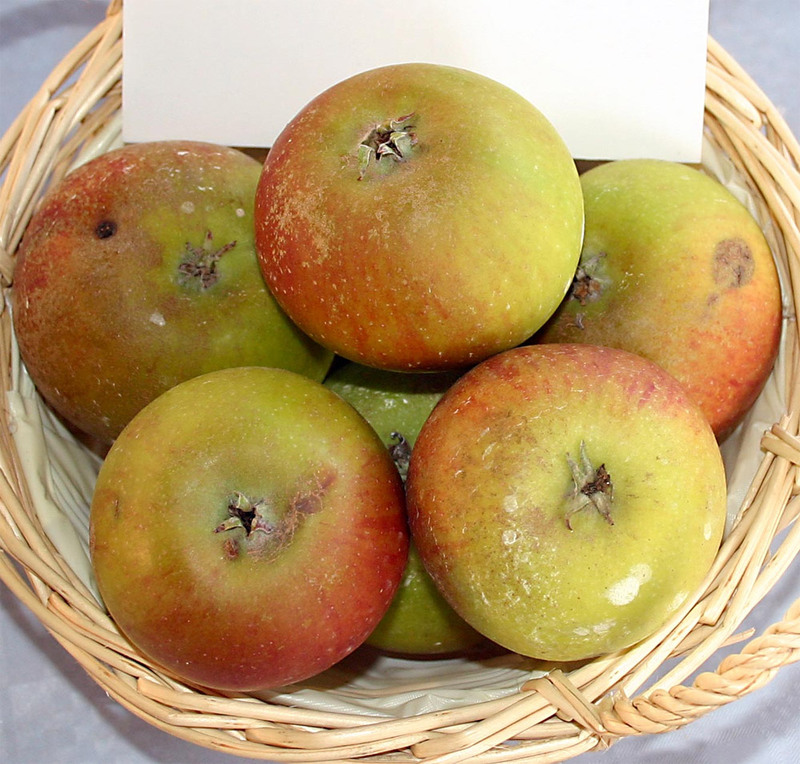 The Stayman is similar to a Winesap apple, yet it is a whole variety on its own. It has a hard crispy yellow flesh. Its flavor is tangy and is best for baking, sauces, and ciders. For a fresh eaten tart apple, its flavor is superb. Sweet Sixteen The Sweet Sixteen is a cross of the Northern Spy and Malinda Apples. It was developed in Minnesota in 1973. It has an aromatic crisp flesh and is very sweet in flavor. This apple is excellent for eating fresh. Swiss Gourmet (Arlet) The Swiss Gourmet Apple, also known as Arlet Apple, came from Switzerland. 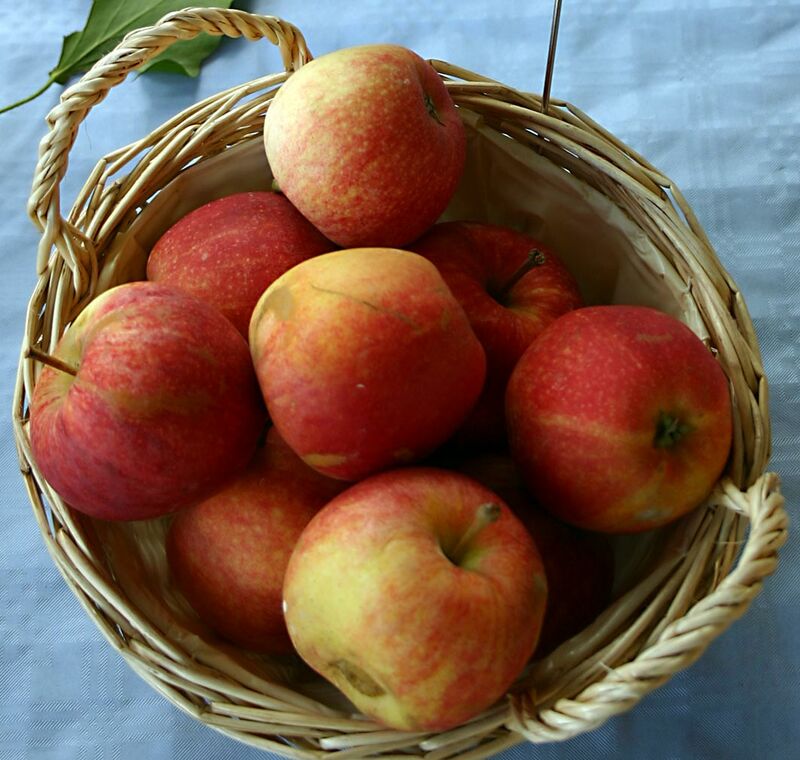 It is a cross between the Golden Delicious and Ida Red Apples. It has a firm tart flesh with a distinctive flavor. It is best eaten fresh. 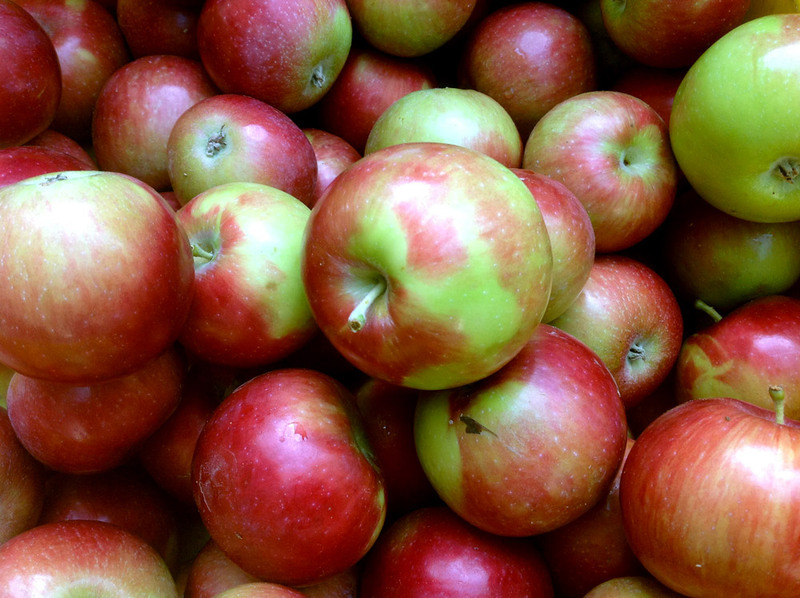 Texas Winesap The Texas Winesap, originated in Indiana, is a sport variety of the Winesap apple. 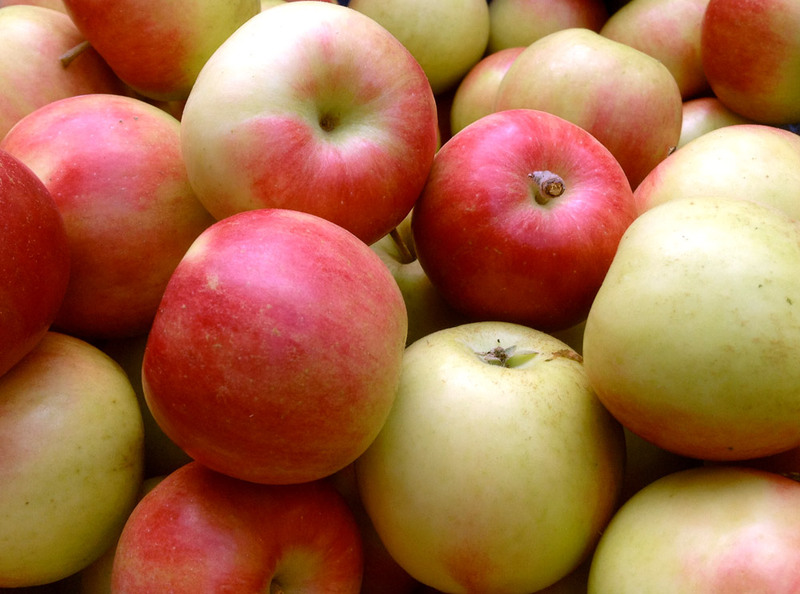 The Winesap apple is believed to be native to New Jersey where it was found in 1817. It has a juicy yellow flesh. 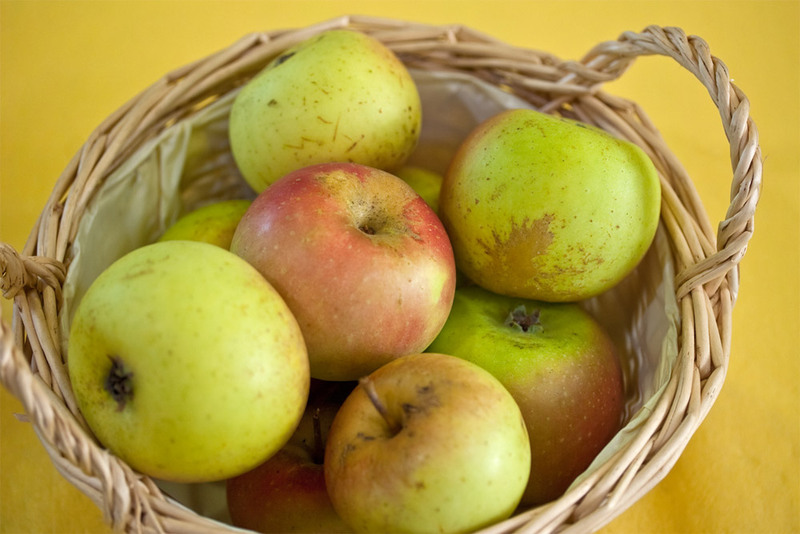 This tart apple has a distinctive aroma and is an excellent cider apple. It is good eaten fresh and excellent cooked. Thome Red Empire The Thome Empire is a sport variety of the Empire Apple from Michigan. 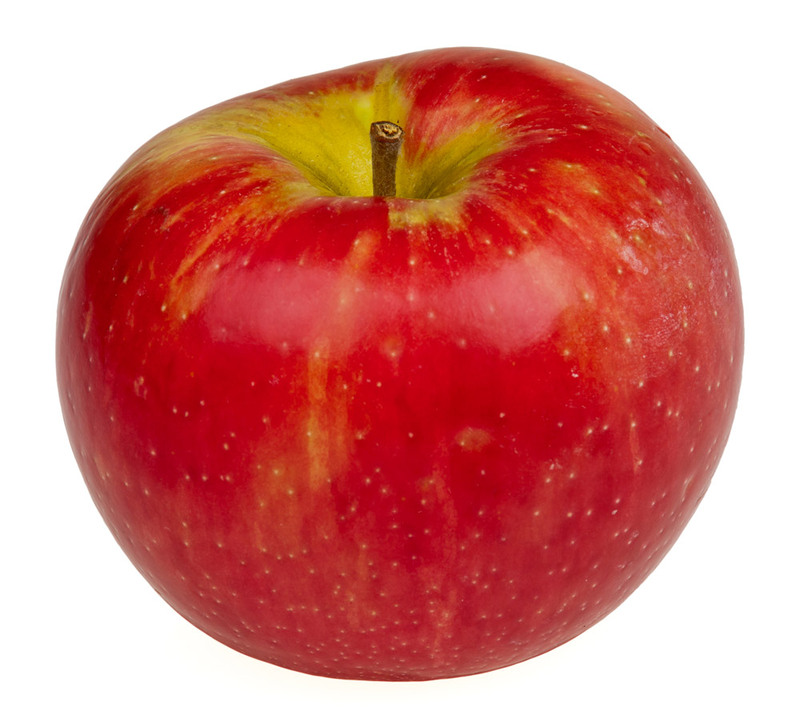 The Empire Apple is a cross of McIntosh and Red Delicious Apples that was introduced in Geneva, New York in 1966. It has a crisp white flesh that is slightly tart and becomes sweeter as the days get colder. It tastes great fresh or in a dessert. Tremlett's Bitter Tremlett’s Bitter is a bittersweet apple from Oxfordshire, England. It is used in many different ciders and ales. It is also used in Calvados, a French Apple Brandy. 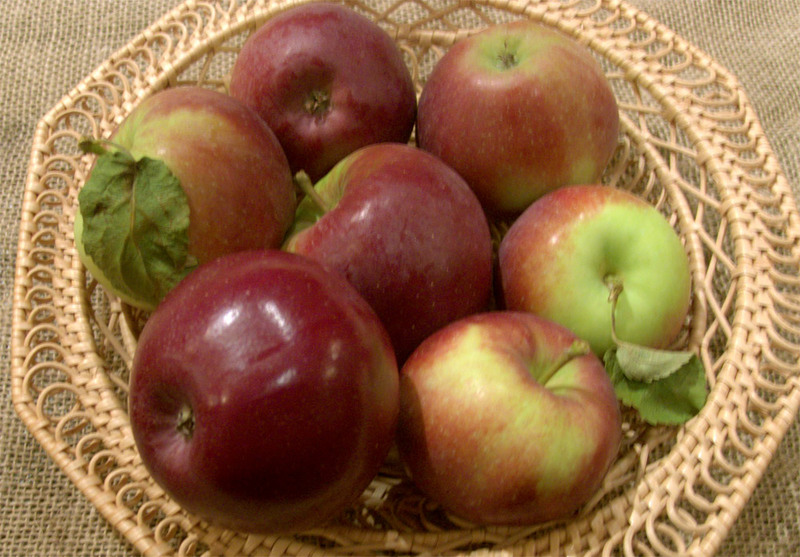 Turley Winesap The Turley Winesap, originated in Indiana, is a sport variety of the Winesap apple. 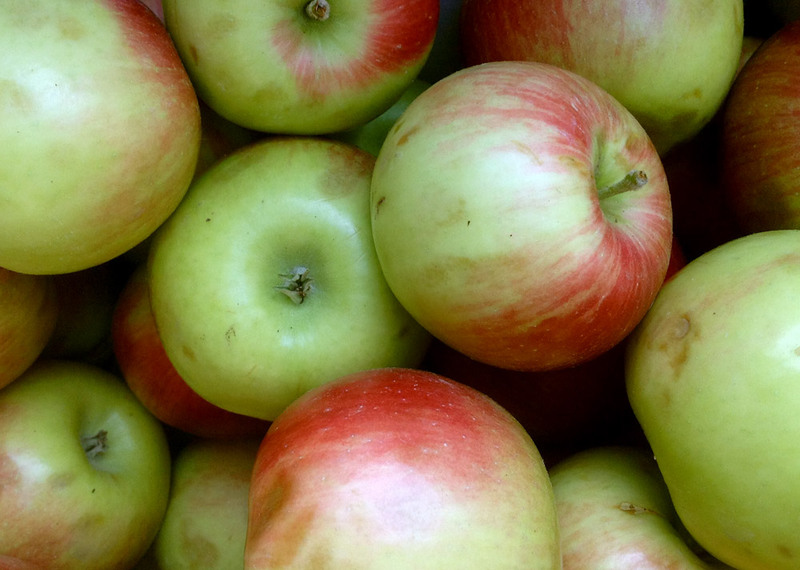 The Winesap apple is believed to be native to New Jersey where it was found in 1817. It has a juicy yellow flesh. 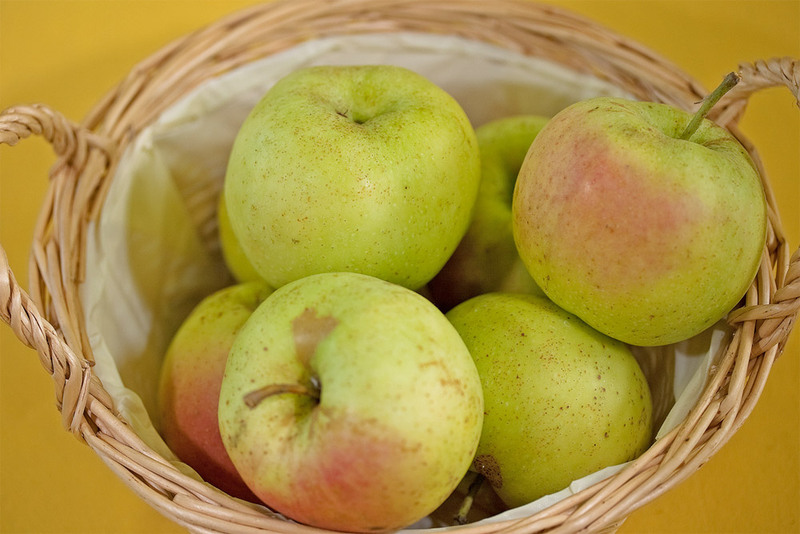 This tart apple has a distinctive aroma and is an excellent cider apple. It is good eaten fresh and excellent cooked. Twenty Ounce Also known as the Cayuga Red Streak, the Twenty Ounce apple is an heirloom apple variety which originated in New York in the early 1800s. It is a sweeter apple and is very juicy. It is a great cooking apple and is excellent eaten fresh. Tydeman's Late Orange Tydeman’s Late Orange is a cross between Cox’s Orange Pippin and Laxton Superb apples. It originated in England in 1930. It has a firm yellow flesh. Its flavor is rich and a good combination of sweet and tart. It is best eaten fresh. Tydeman's Red Tydeman’s Red Apple is a cross between the Worcester Pearmain and Red McIntosh. It was developed in England in 1929 as a sauce and dessert apple. Its flavor has a slight hint of cinnamon. UltraMac The Ultramac is a sport variety of the McIntosh. The McIntosh Apple was developed in Ontario, Canada in 1798. The McIntosh Apple has a distinct perfume-like aroma. The flesh is firm, juicy, and white. It is an all purpose apple great for eating fresh, cooking, cider, or juice. UltraRed Jonathan The Ultrared Jonathan Apple is a sport variety of the Jonathan Apple that comes a little earlier in the season. The Jonathan Apple, also known as the Philip Rick Apple, originated in New York in 1862. The Jonathan is an excellent apple eaten fresh and stores very well. It has a crisp, juicy flesh that makes an excellent sauce. Valstar Elstar The Valstar Elstar is a sport variety of the Lustre Elstar apple. The Lustre Elstar was developed in Holland in 1955. It is a cross of Golden Delicious and Ingrid Marie. Its firm, sweet, tart flesh makes it great for fresh eating and pie. Its flavor improves after four weeks of cold storage. Viking The Viking Apple was developed by the Purdue, Rutgers, Illinois Co Op and introduced in 1969. It is very aromatic and holds its flavor well when cooked. The Viking Apple has a tart white flesh. Vista Bella The Vista Bella is a Canadian apple that is a cross between the Melba, Starr, Julyred, Williams, and Sonora apples. It has white juicy flesh. It has a sweet aromatic taste with an essence of raspberries. It is great eaten fresh and is excellent cooked. William's Pride William’s Pride Apples were developed by the Purdue, Rutgers, Illinois Co Op in 1988. 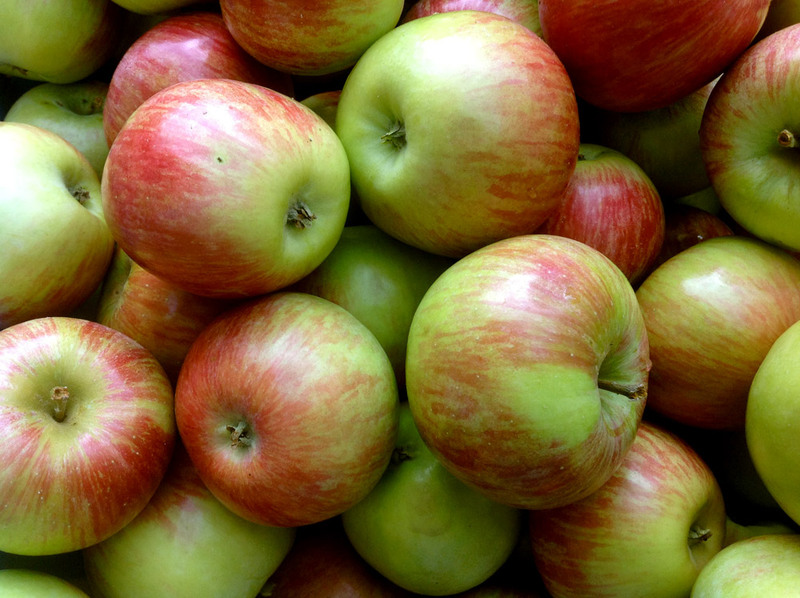 These apples have a sweet aromatic flavor and are best eaten fresh. The ripest apples have a pinkish flesh that makes a nicely colored apple sauce. Wolf River The Wolf River came about as an Alexander Apple Seedling in Wisconsin in 1875. The flesh is tender with a mild tartness. It is heralded as the best culinary apple around. As this apple cooks, it maintains its volume very well. Yataka The Yataka is a sport variety of the Fuji apple. The Fuji apple is a cross of the Ralls Janet and Delicious apples. It was developed in Japan in 1963. The Fuji apple is hard, crisp, and juicy. It has an excellent sweet tart flavor. This apple can be used for cooking but is best eaten fresh. It will keep well in storage for long periods of time. Yellow Transparent Also known as the White Transparent, this is a Russian heirloom. It was first introduced to the United States in 1870. This is the most famous summer apple and is crisp juicy and sweet. Many people prefer them green. It is excellent for all cooking and is often used in apple wine. Nichols grows more than 1,000 items in a given year"